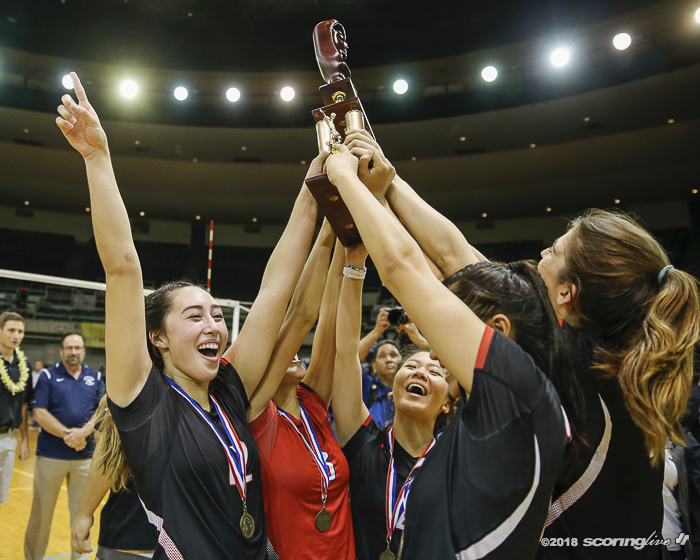 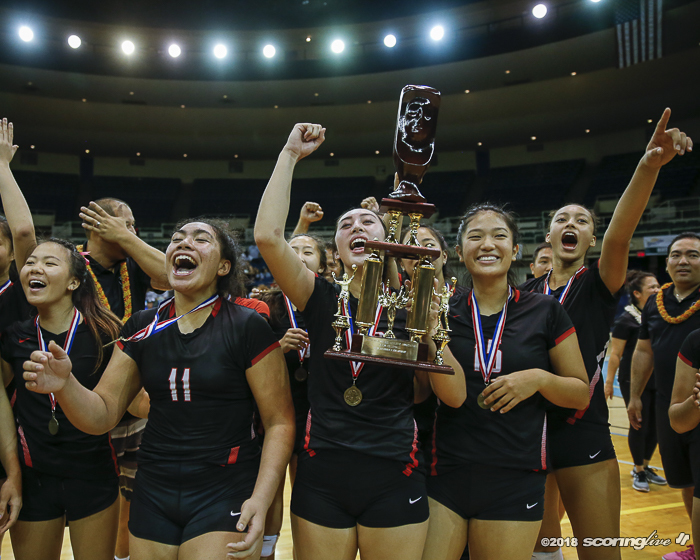 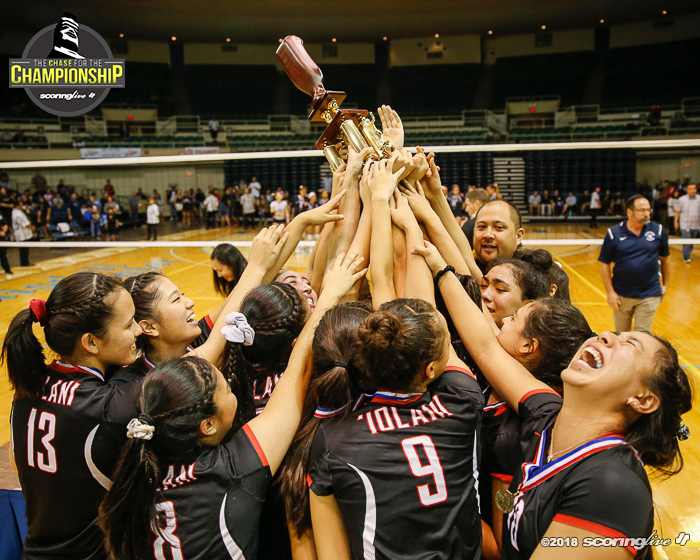 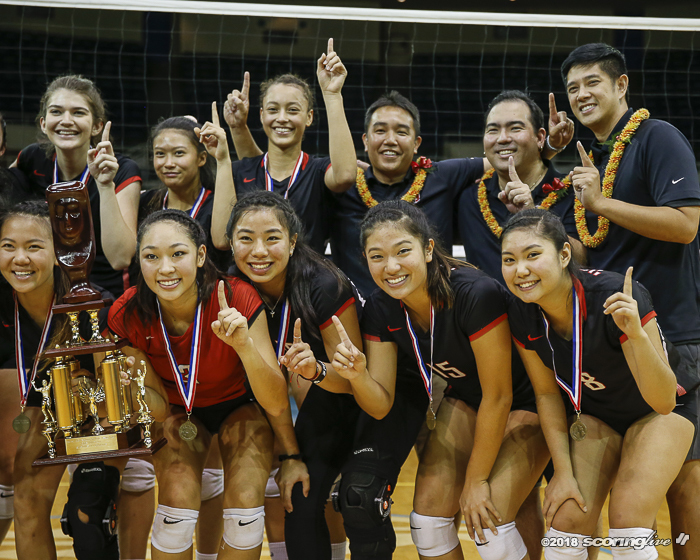 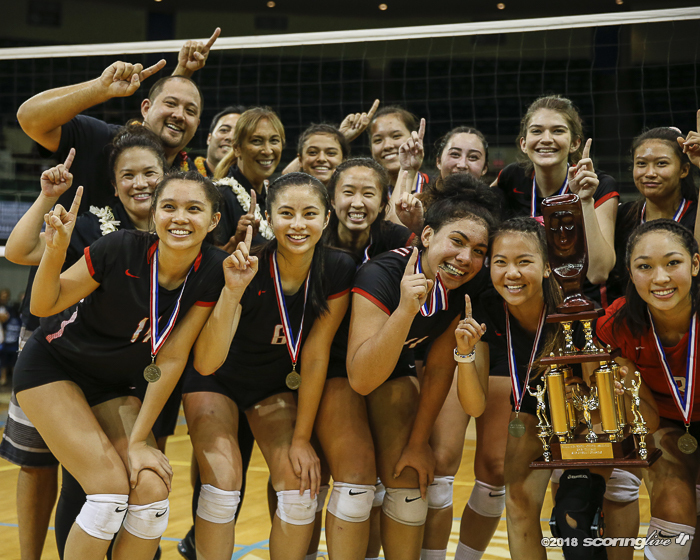 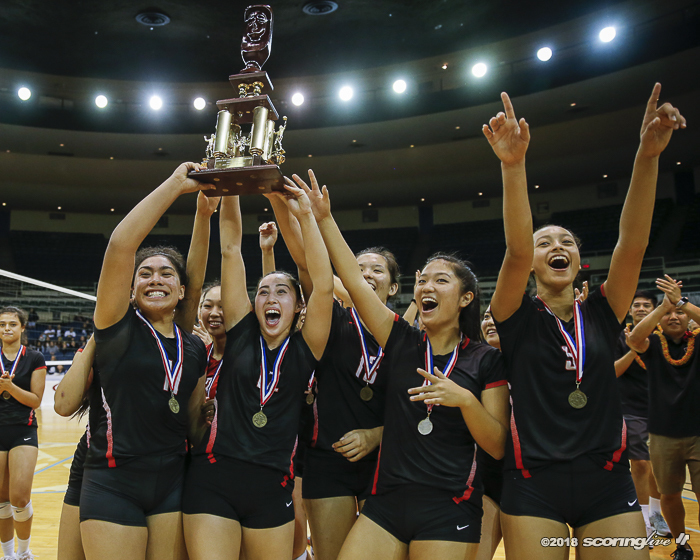 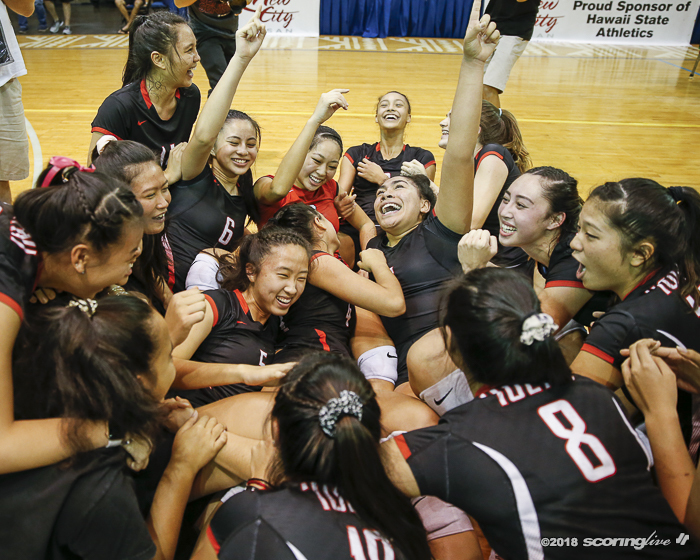 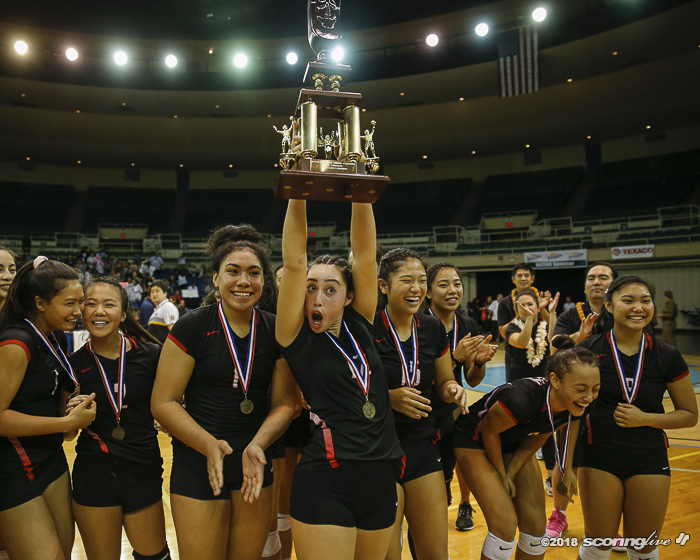 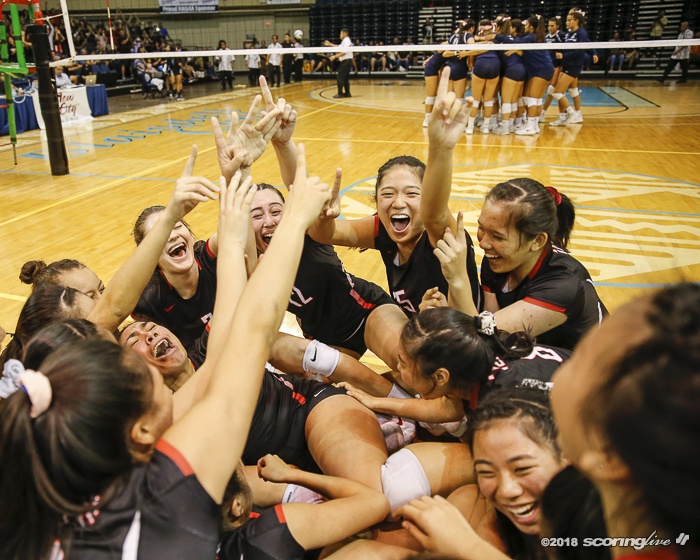 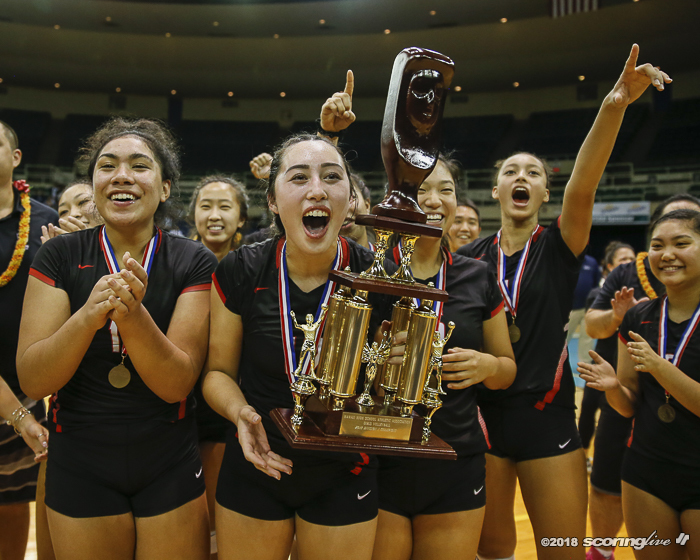 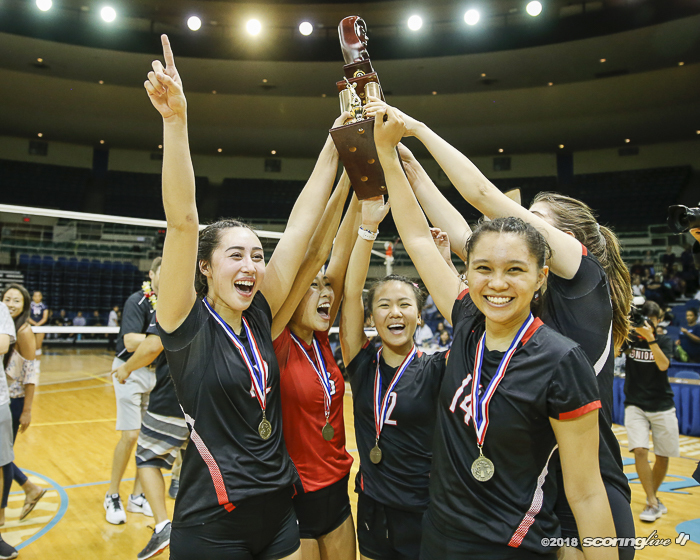 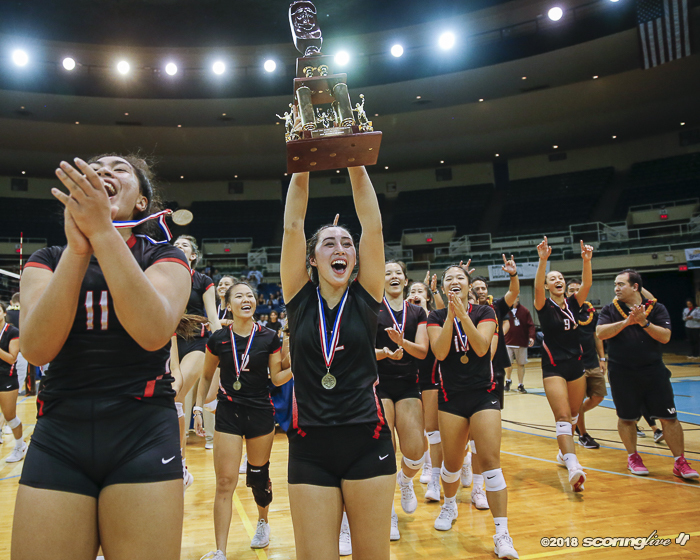 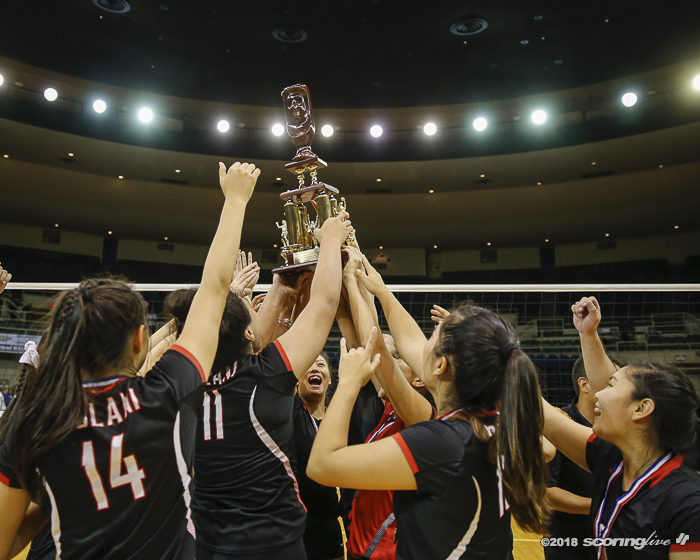 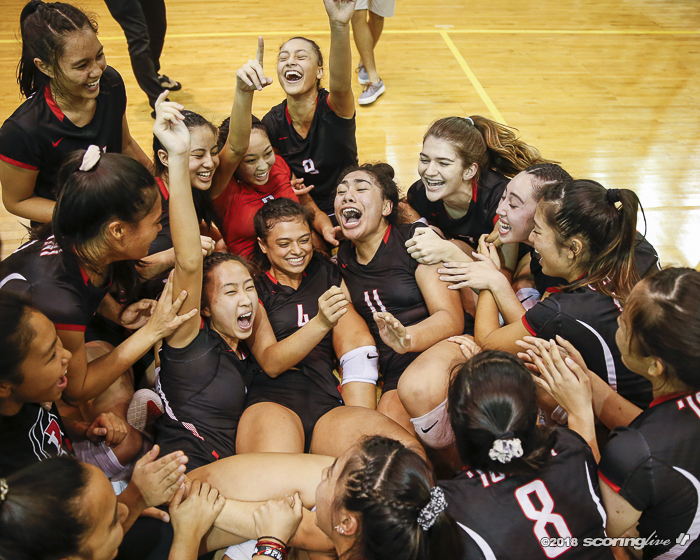 KAKAAKO — Iolani played its best match when it mattered the most and the result was the ultimate prize. 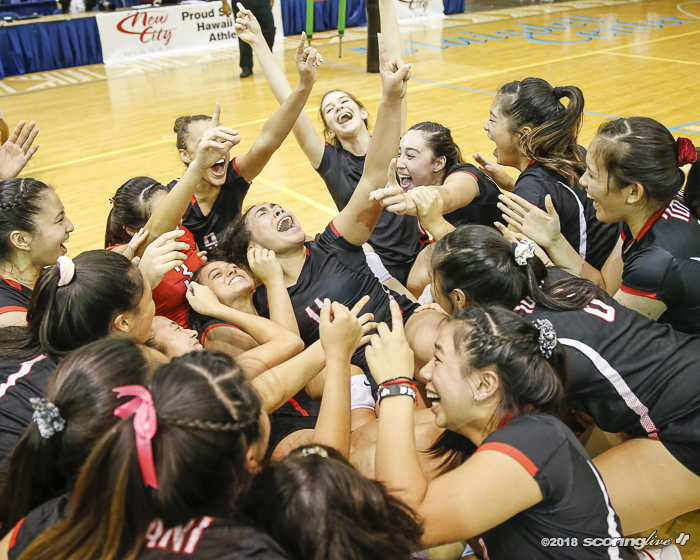 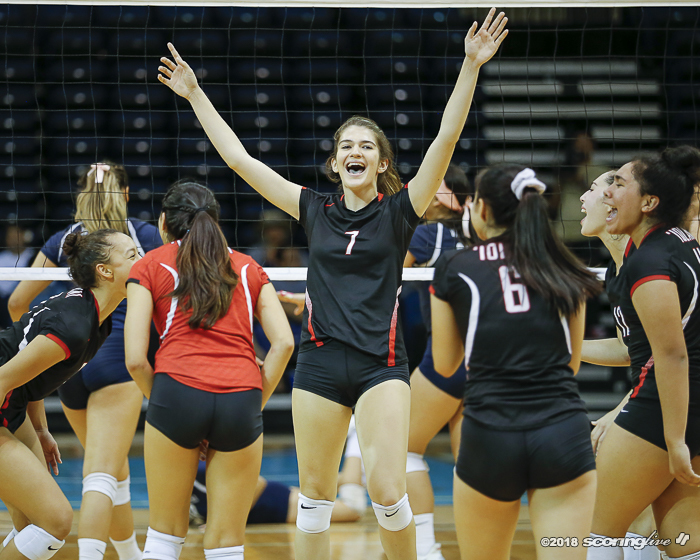 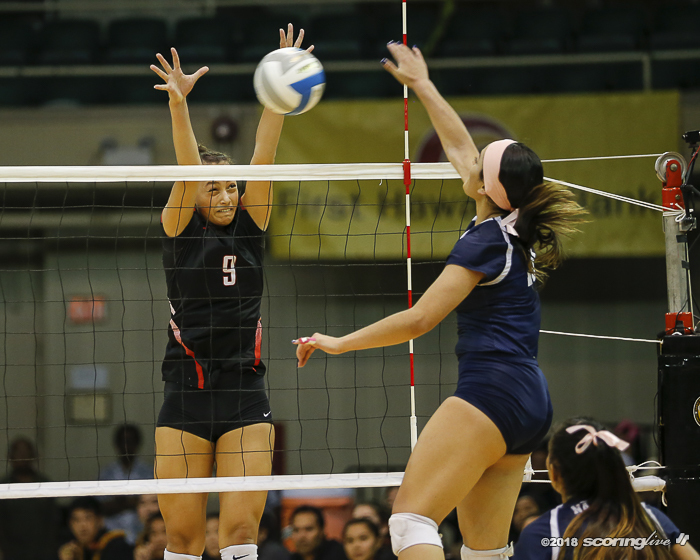 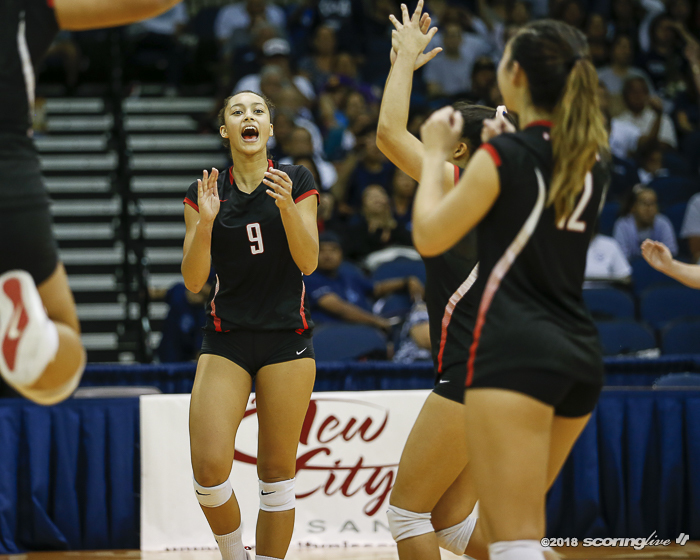 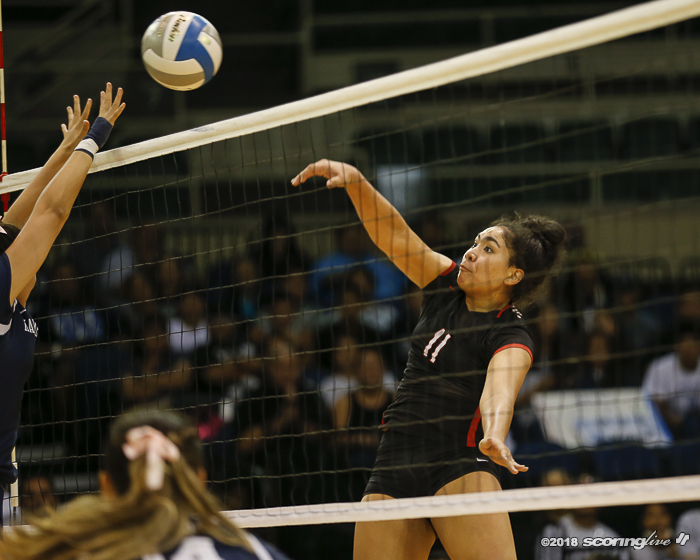 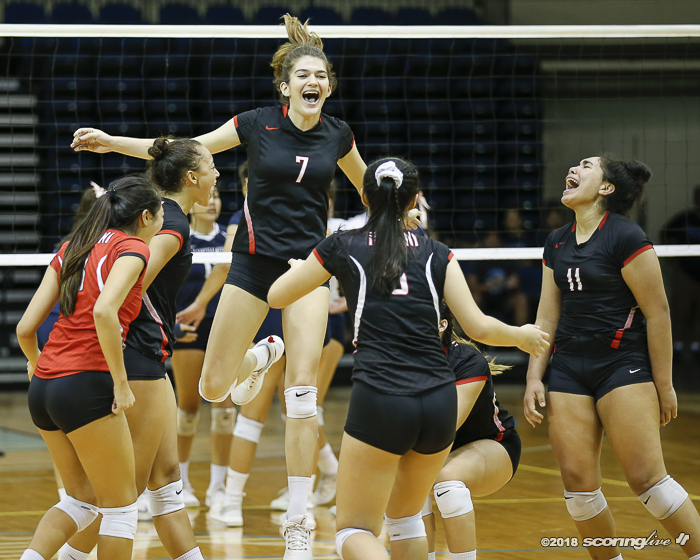 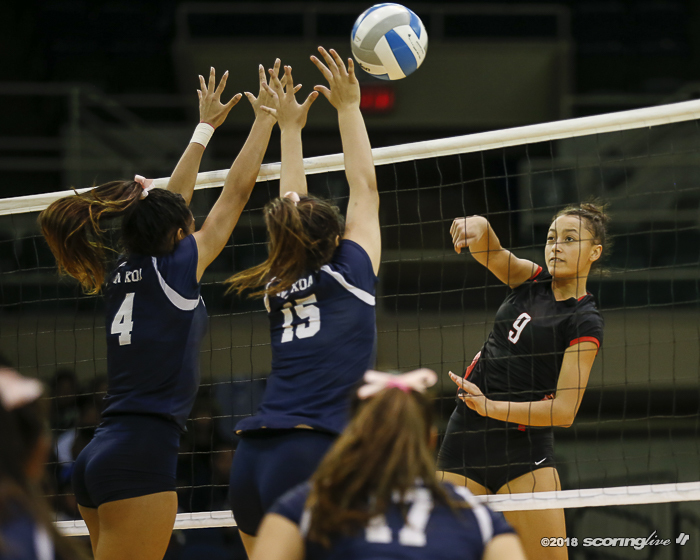 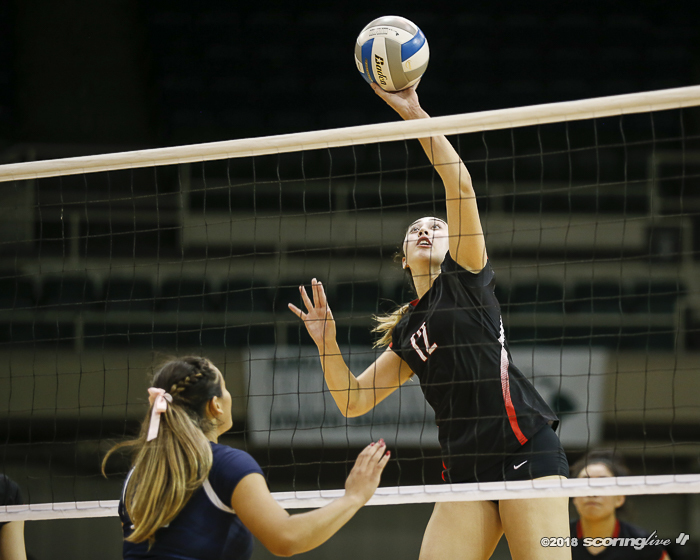 Elena Oglivie put down a match-high 28 kills to lead second-ranked Iolani to a sweep of top-ranked Kamehameha in the title game of the New City Nissan Division I Girls Volleyball State Championships before a crowd of 2,265 fans at the Neal S. Blaisdell Center Arena Saturday night. 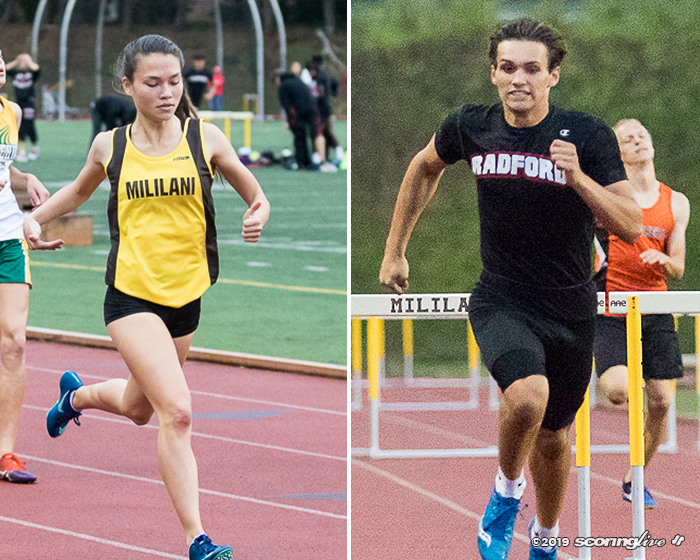 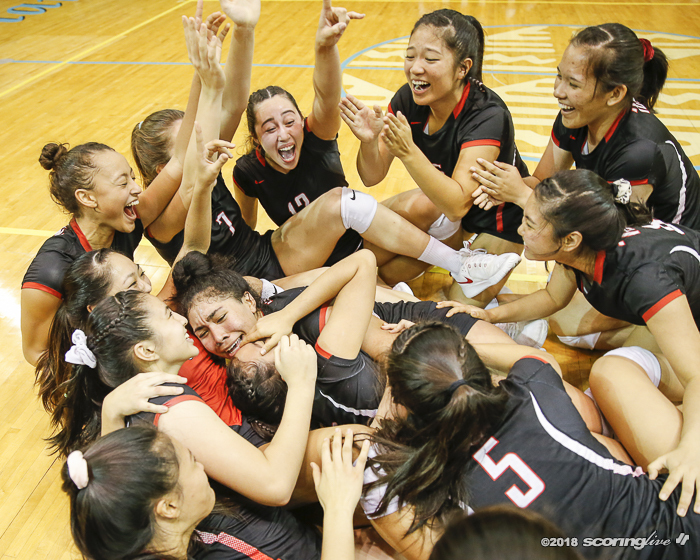 The Raiders (13-5), who went unseeded in the tournament as the Interscholastic League of Honolulu runner-up, avenged five prior losses to the Warriors (14-2) this season to claim their second state crown and first since 2016. 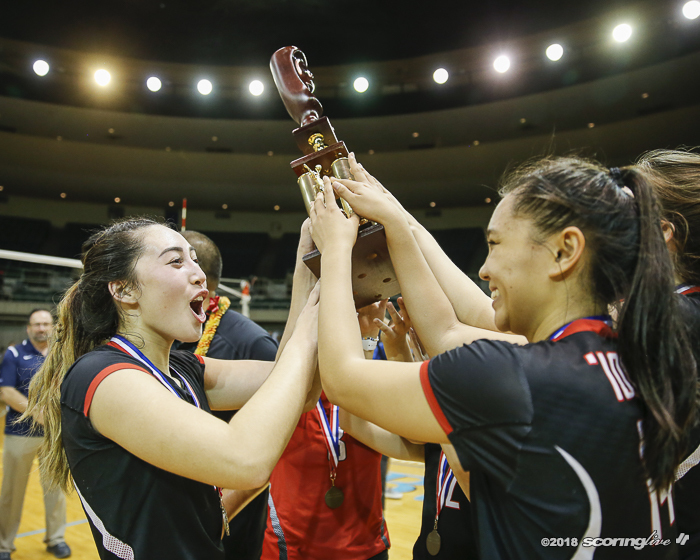 "It was definitely rewarding," said Oglivie, a junior outside hitter. 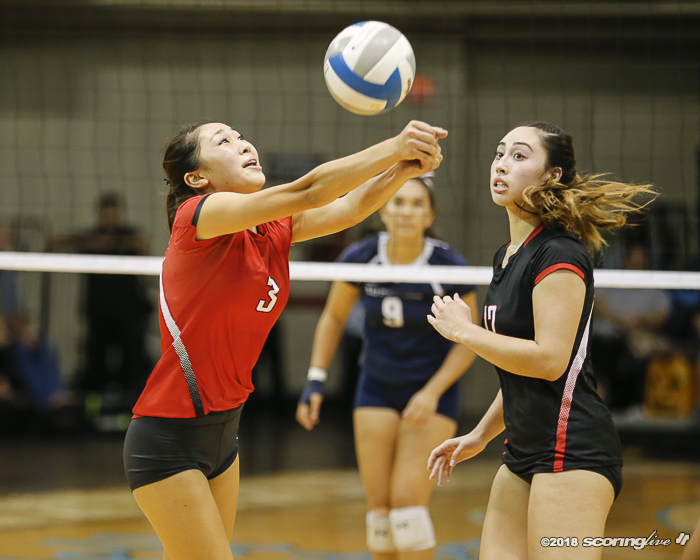 "We only beat them once in the season, but the last match we played against them (a five-set loss for the ILH title nine days ago) gave us a lot of momentum. 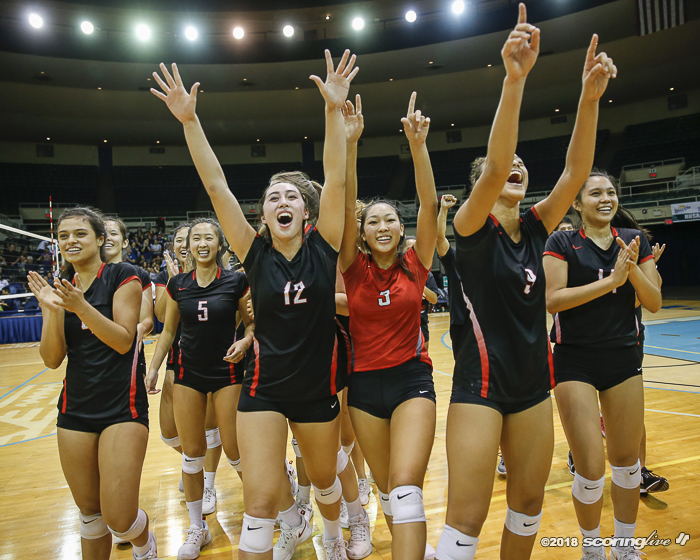 We knew that we could win. 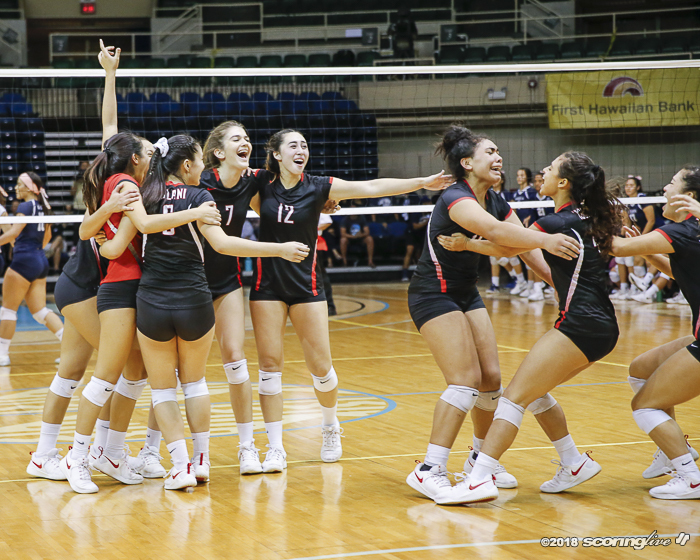 We won one game against them, so we just had that mentality that ‘we can win this game, this game is gonna be our game.' 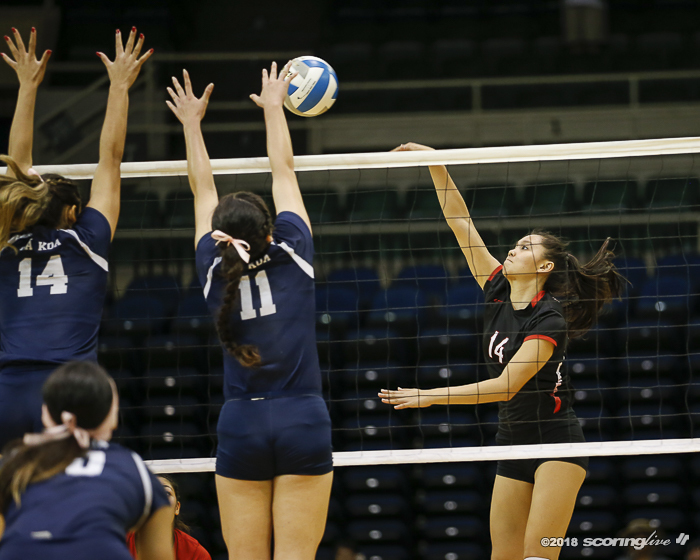 "
Iolani hit .268 for the match to just .165 for Kamehameha, the defending state champion. 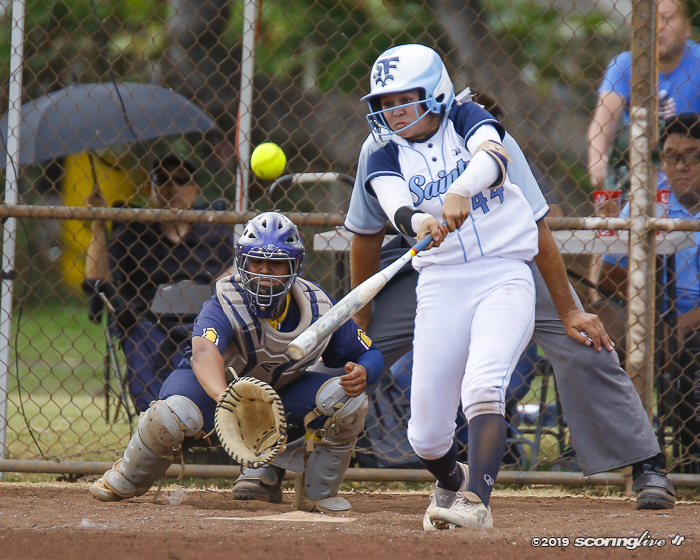 Oglivie took 70 of the Raiders' 123 total swings. 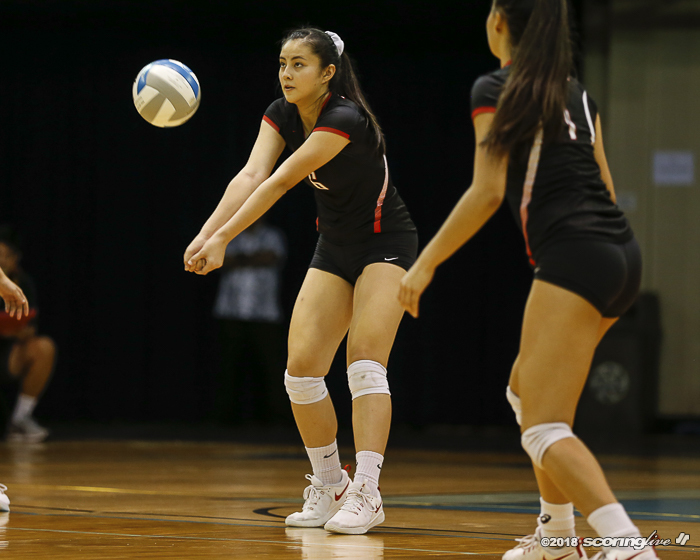 She committed eight errors and hit .286 for the match. 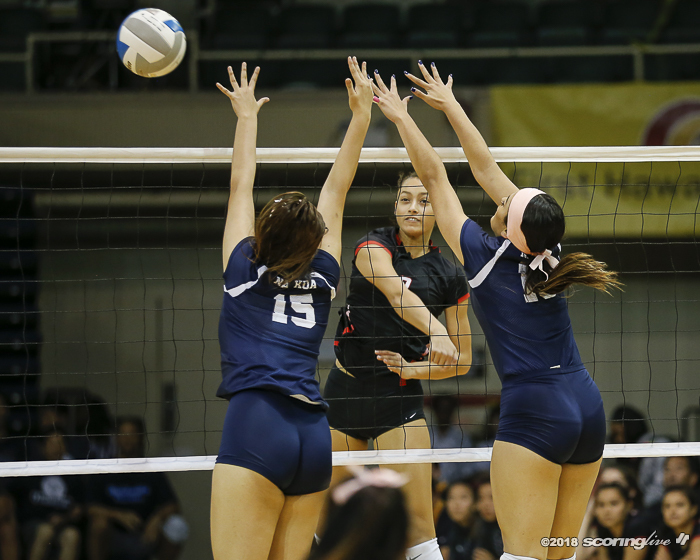 "We played really well, we executed at a high level and I thought we served really tough. 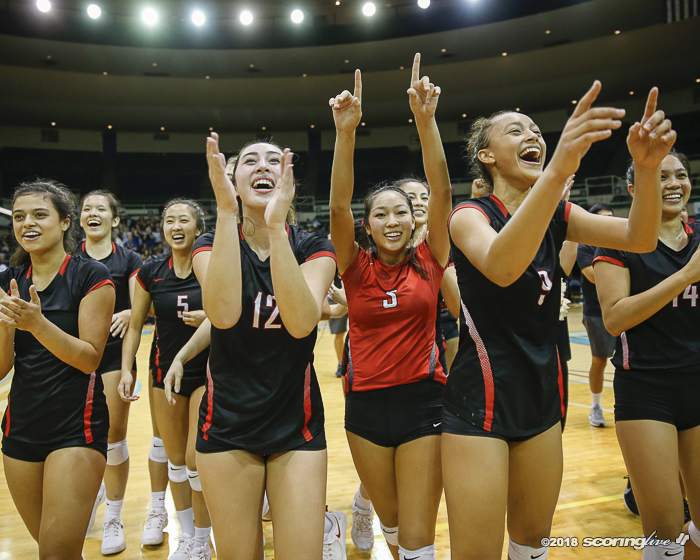 Maybe (the Warriors) didn't have their best game, but I'd like to think that it was a little bit of what we did tonight," Iolani coach Kainoa Obrey said. 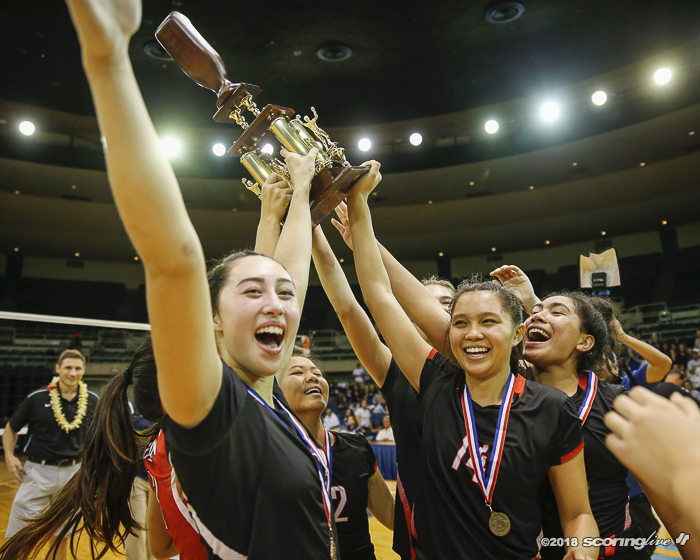 "Our hitters hit really well. 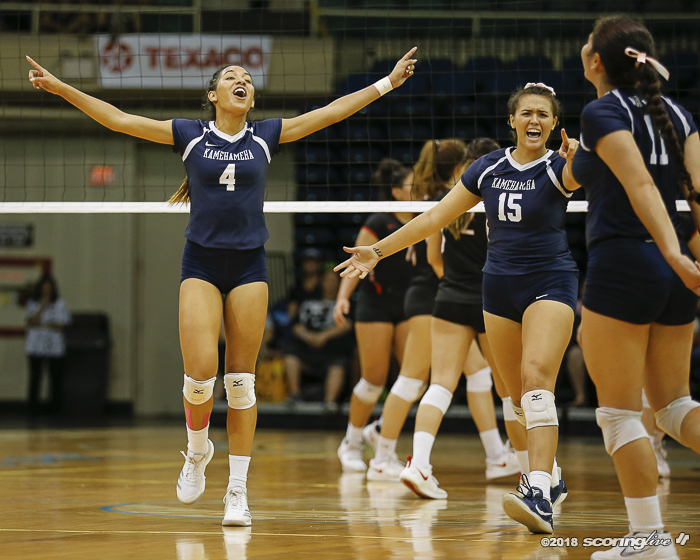 I mean, Elena of course, goes off for us and that's huge. 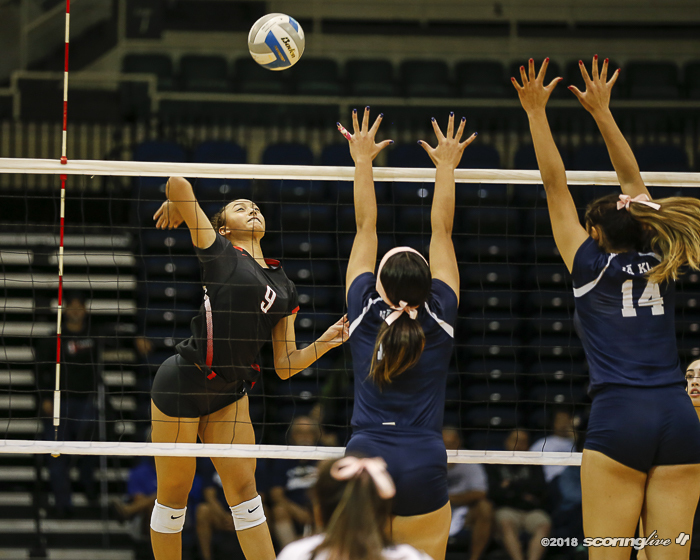 I mean, just getting points from her just kind of opens things up for other girls to take good swings, but our defense was really good tonight," Obrey said. 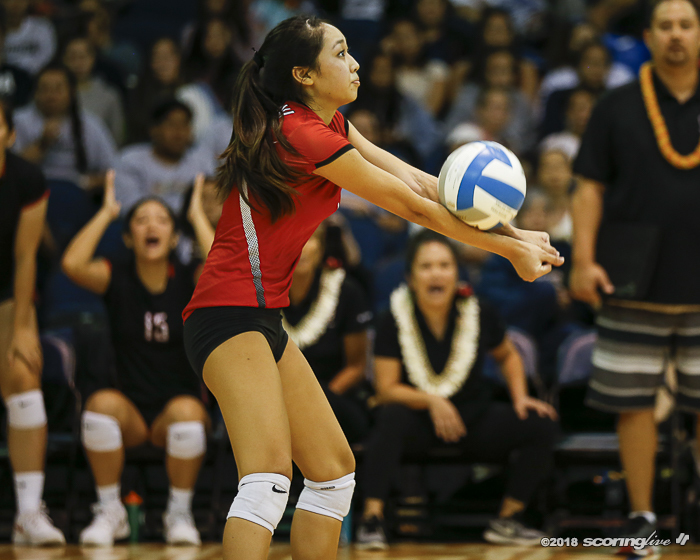 "I thought we dug a lot of good balls, we forced them to hit some balls out — that's uncharacteristic of them — so we're pretty happy the way we played tonight." 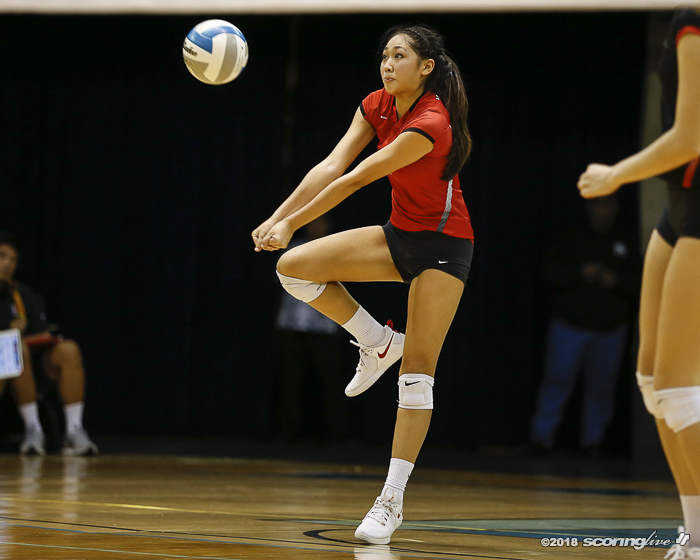 Senior libero Grace Wee dug a match-high 20 balls and was also a perfect 21-for-21 on serve-receive opportunities. 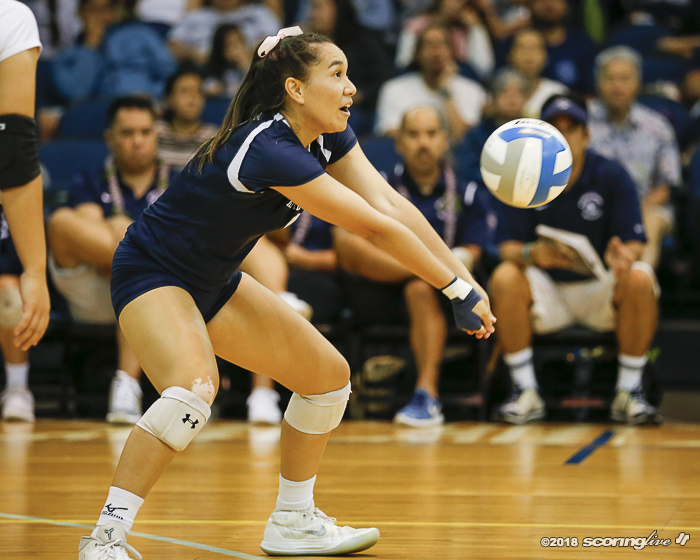 Sophomore defensive specialist Becca Sakoda recorded 15 digs and was 18 of 19 on serve-receive. 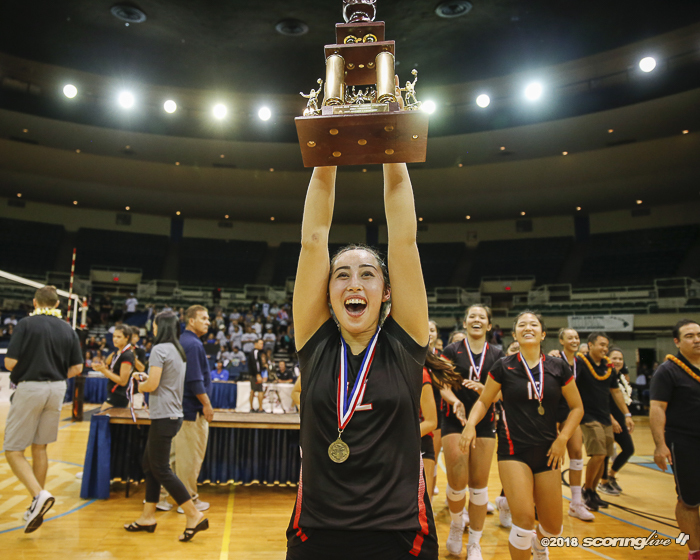 "It was tremendous. 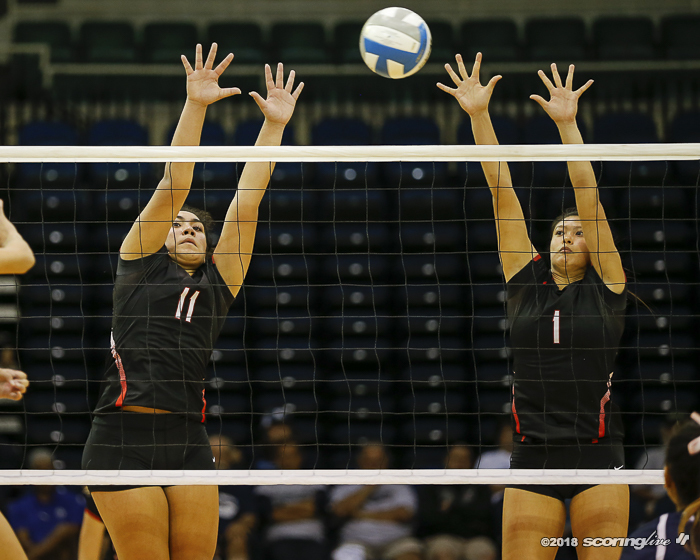 I mean, just tremendous," Obrey said of the pair of back row players. 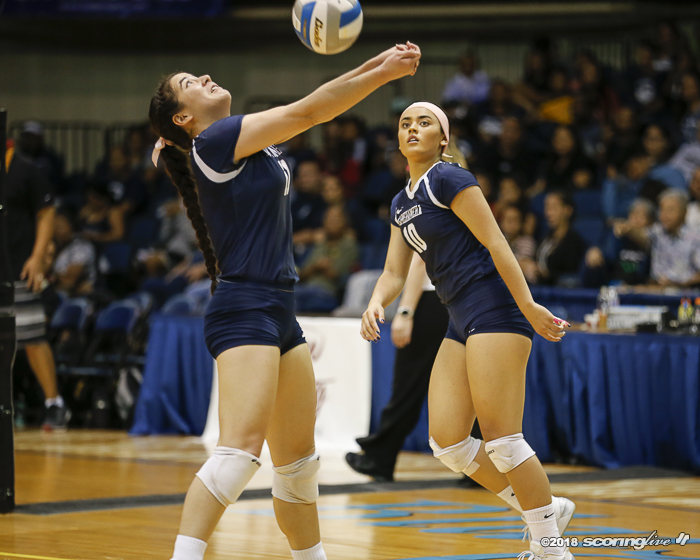 "The value of them is great for us because they started on the bench for us at the beginning of the year and Grace was in a different role as just a (defensive specialist), so she moved over to (libero) and then Becca had to play a little bit more, so I'm real happy with how they've come along the last two-and-a-half, three weeks and they definitely stepped up big for us tonight and I'm happy to see them play well." 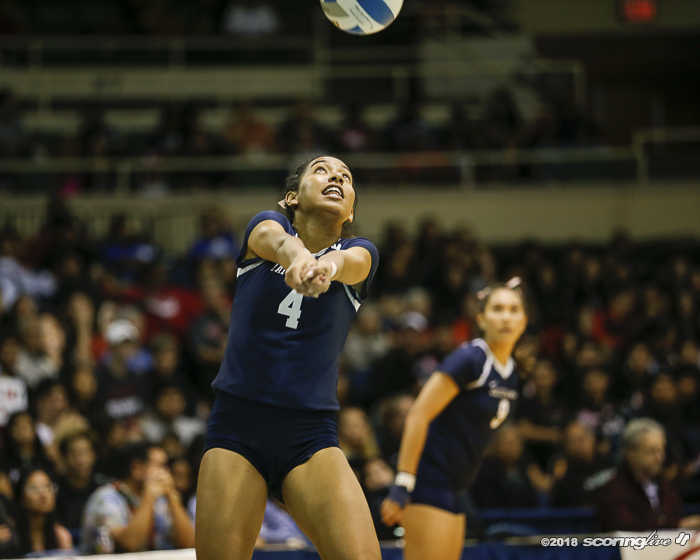 Oglivie agreed with her coach's assessment that it was the Raiders' defense that set the tone. 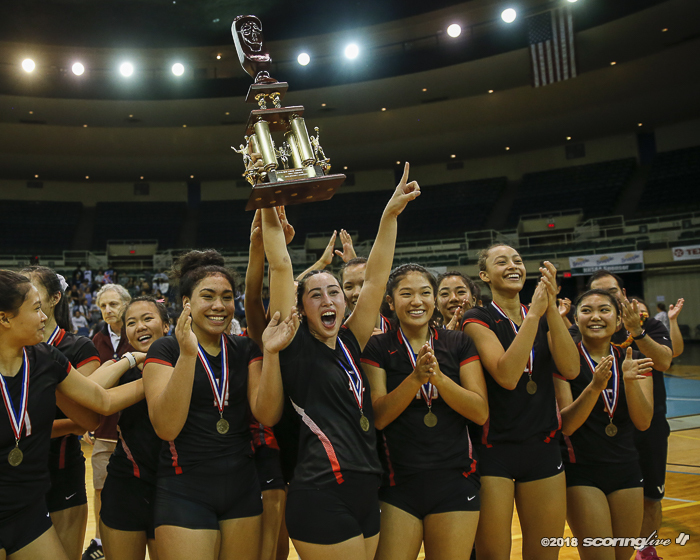 "I thought we did a good job staying disciplined. 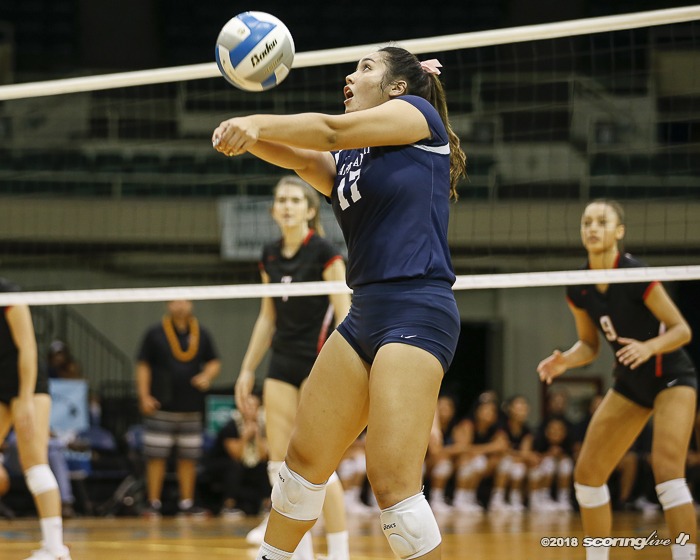 Our defense was spot on, we knew their tendencies, we followed the scouting report and just staying disciplined and making every play that we could," Oglivie said. 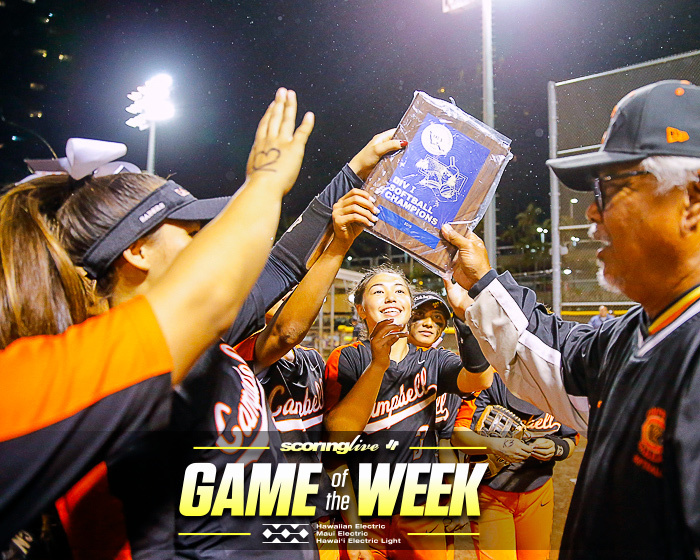 "I think we just had the mindset of not letting any ball touch the ground. 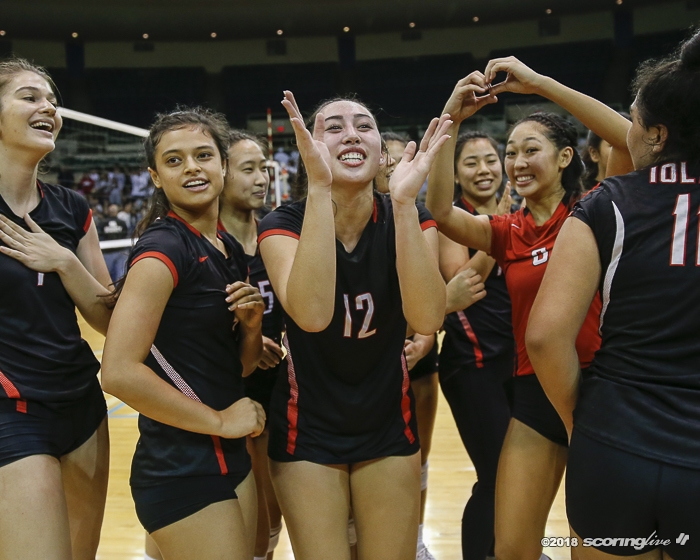 We had a scouting report and I thought we did a good job sticking to it, just knowing their tendencies and going in there and digging every ball that we could." 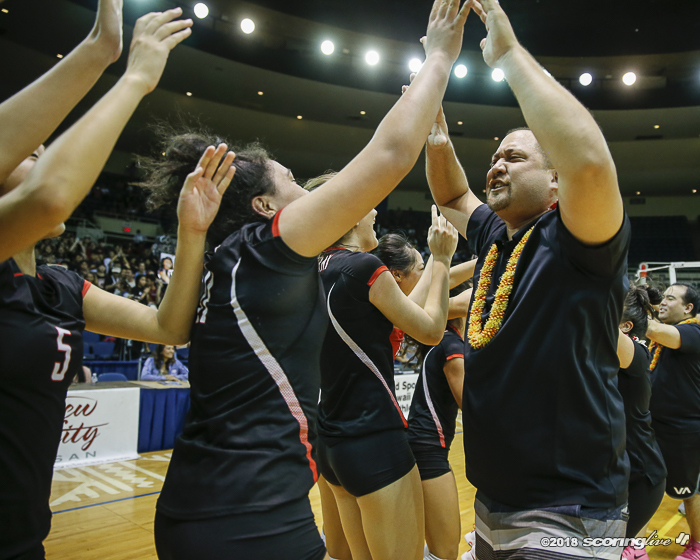 Wee, in turn, credited the coaching staff for preparing the players adequately. 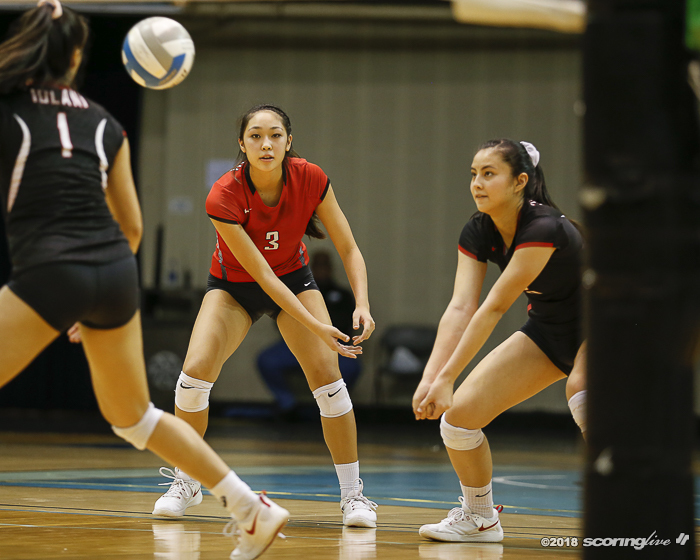 "Our coaches did a good job of watching a lot of film, so they gave us certain positions to line up in, so we were able to line up well in defense and also the blocks made it a lot easier for us to kind of read around them," Wee said. 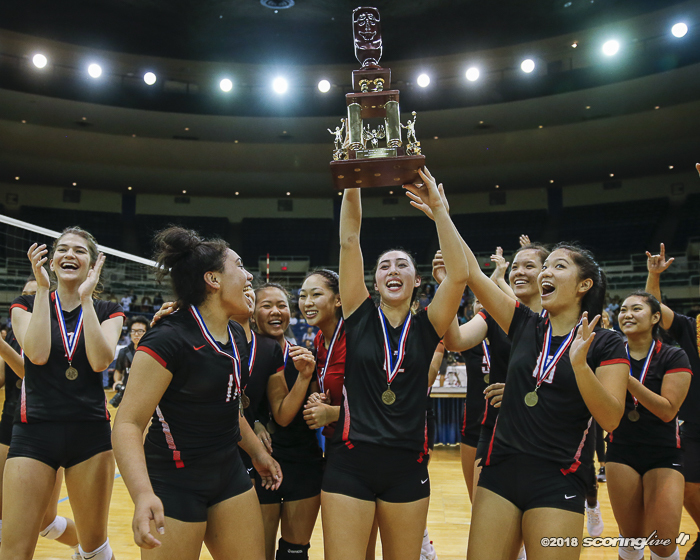 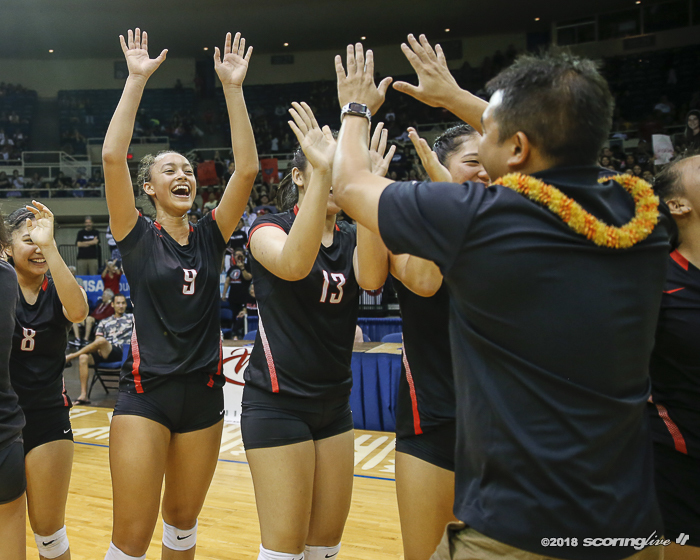 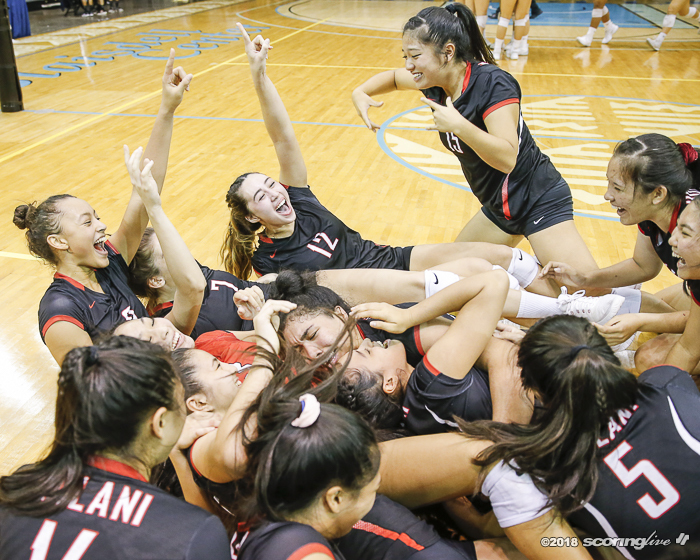 And then there were the intangibles that factored into Iolani's motivation. 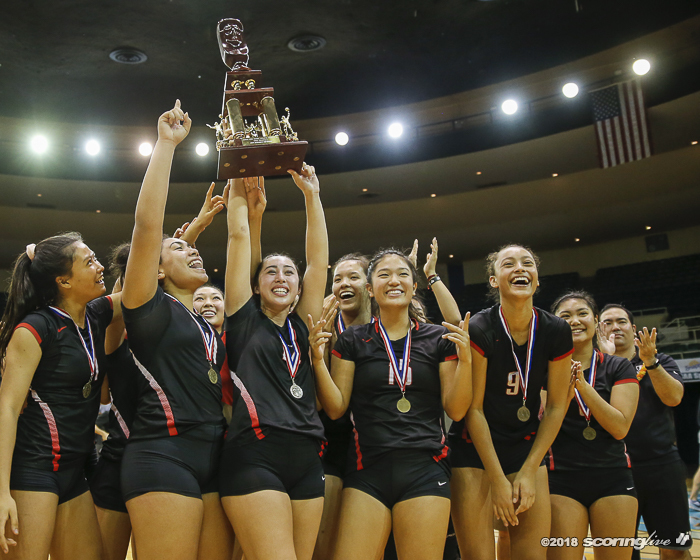 "I think it was that determination and that fire that drove us throughout the entire season. 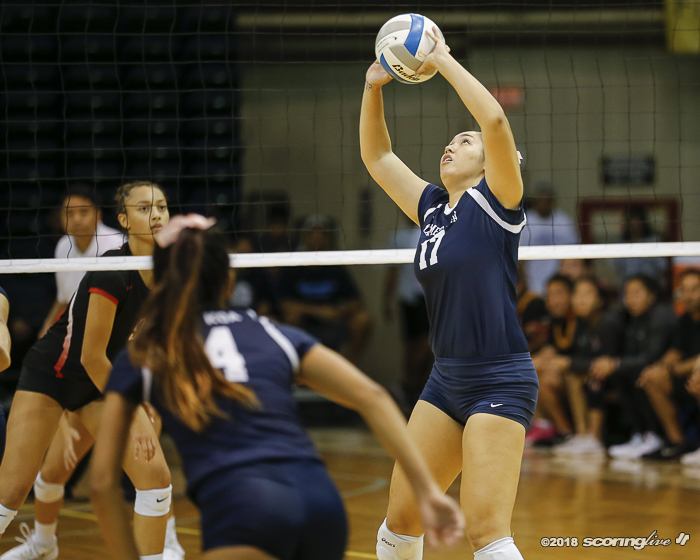 Losing match after match against Kamehameha I think it really drove us in this championship match to take it," Wee said. 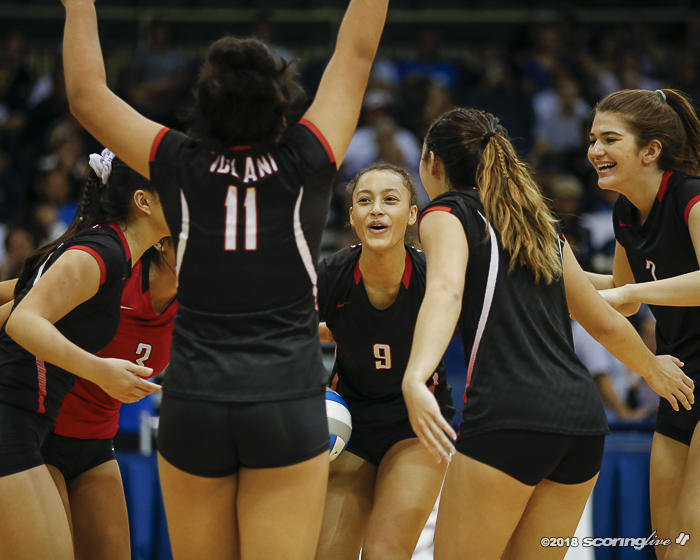 Obrey said it was a combination of both tactical adjustments and improved execution this time around. 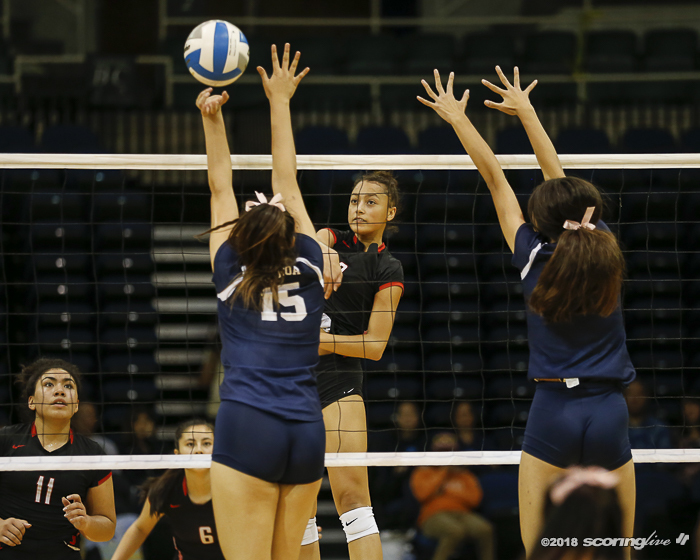 "I would say a mix. 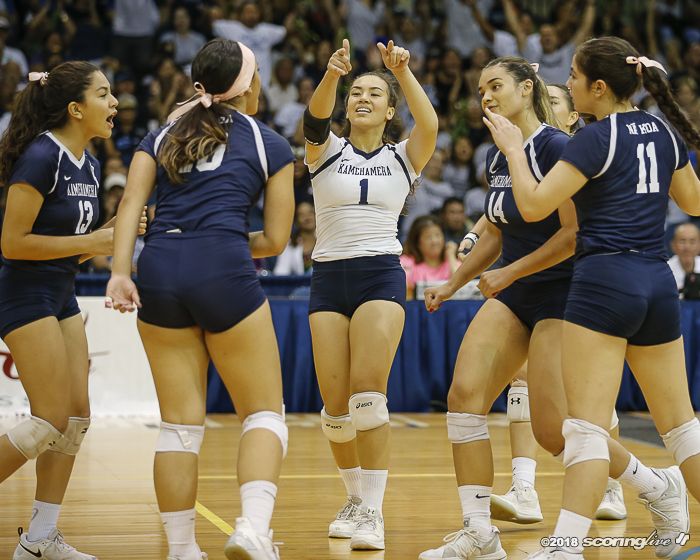 I think offensively we ran some different things, of course, that we didn't do throughout the year and then defensively we got into new positions that kind of gave us a little bit more benefit in terms of being able to stand the ball up. 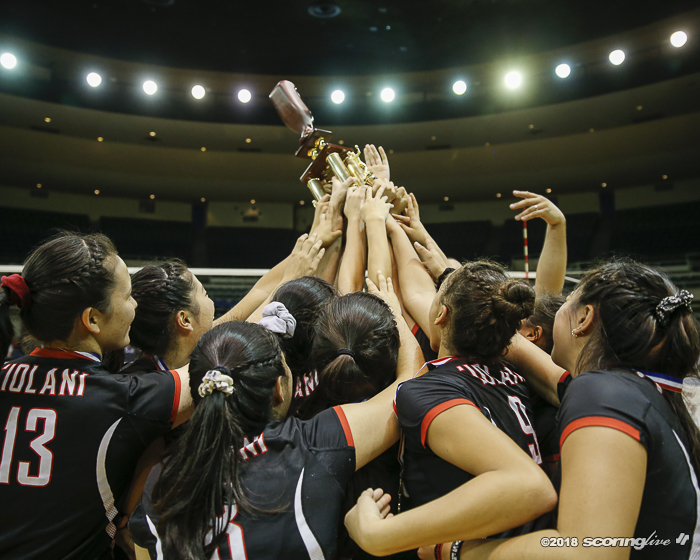 Again, we play them a lot so we have a lot of information. 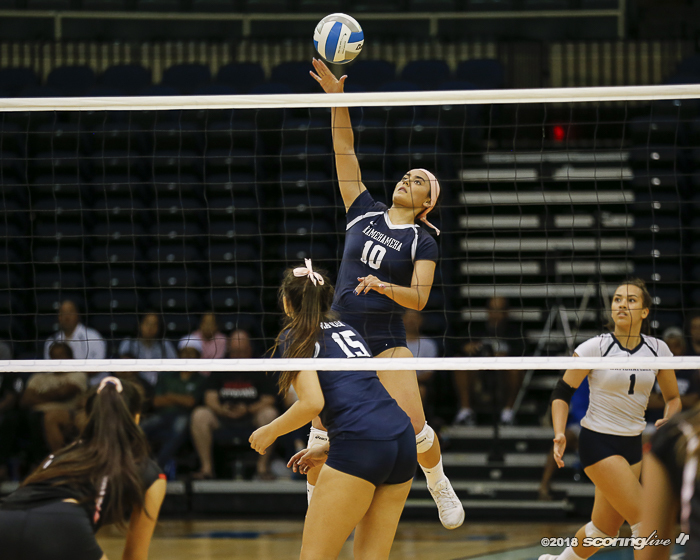 We just made some pretty good adjustments and got really good execution," Obrey said. 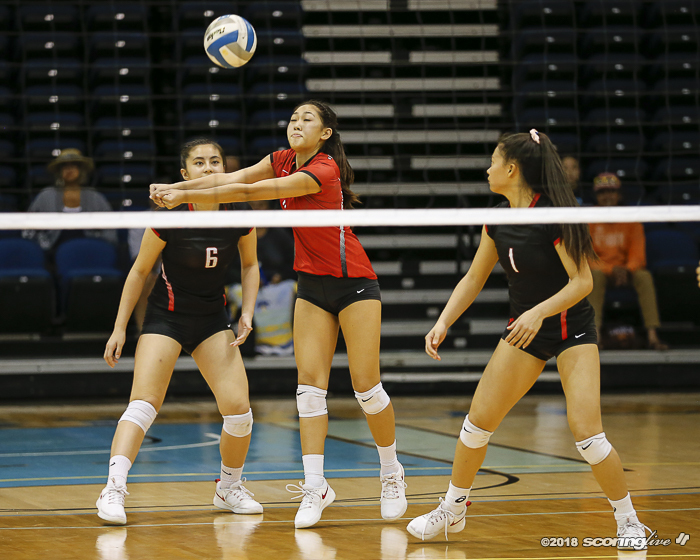 The teams traded points for much of the first set. 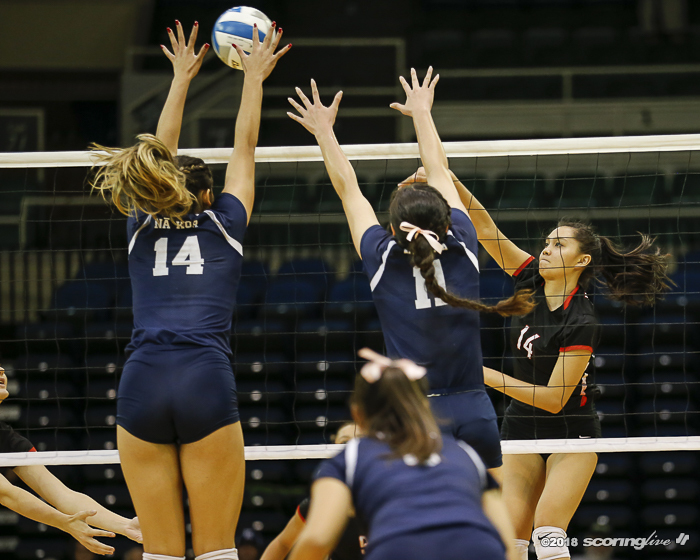 An Iolani service error gave Kamehameha a brief 16-15 lead, but the Raiders answered with a 9-1 run that included five kills by Oglivie to pull ahead, 24-17. 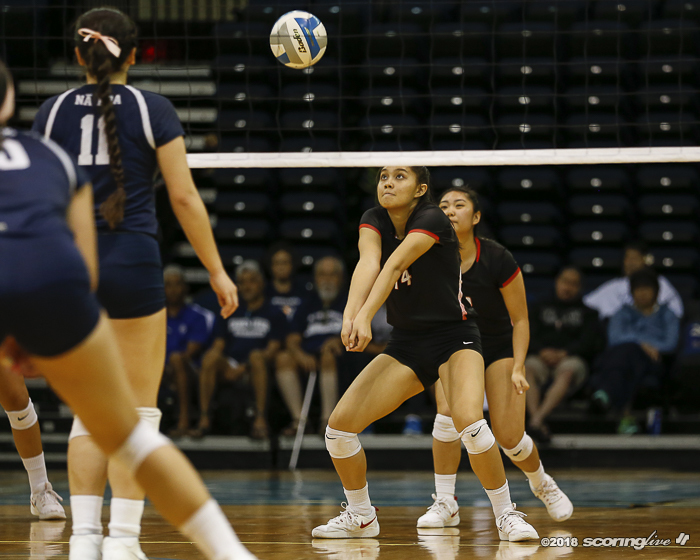 The Warriors stormed back with a 6-0 run that included three Braelyn Akana kills out of the middle, but Oglivie closed the door on the opening set with a kill from the left side, her 10th of the game. 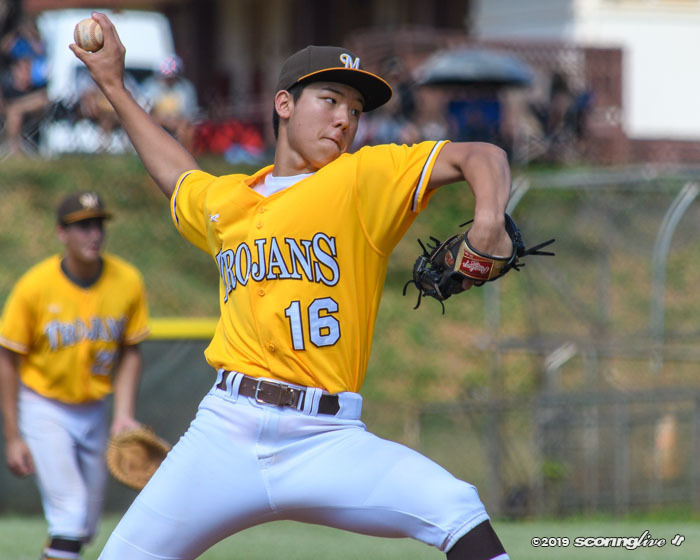 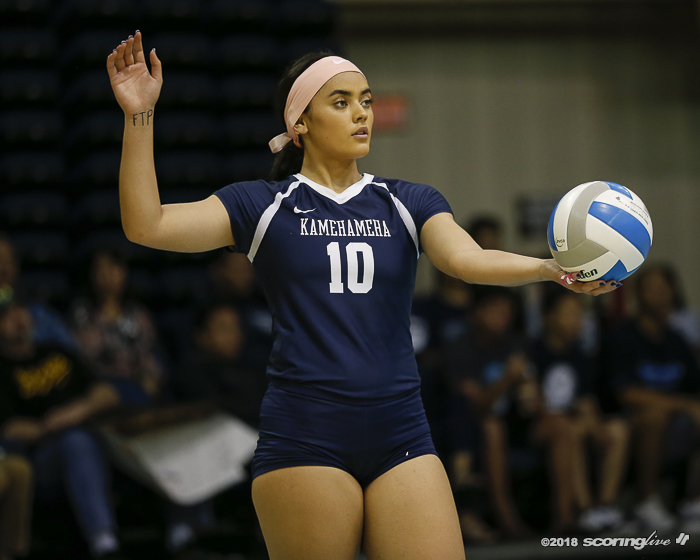 In game 2, Kamehameha held a 6-3 lead after an ace by Keonilei Akana, but Iolani surged ahead with a 7-1 run that included three hitting errors and a four-contact violation by the Warriors. 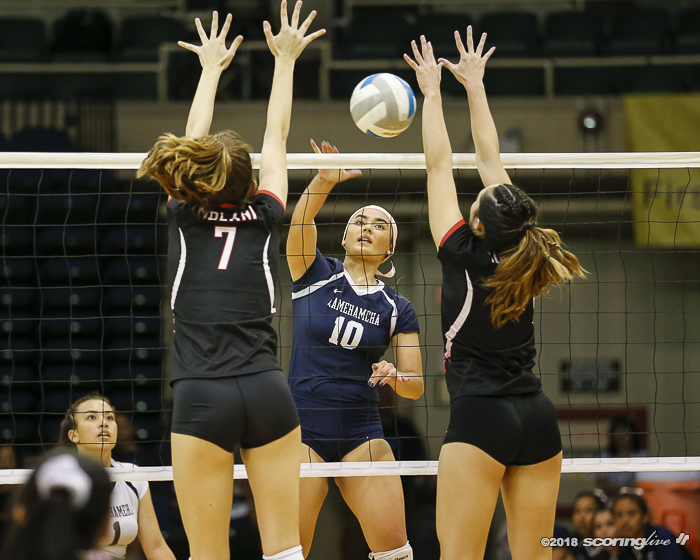 Kamehameha used a 6-2 run to pull within 19-18 later in the set, but Iolani called timeout and responded with a 4-0 run capped by a Sakoda kill from the back row off a bump set from Oglivie. 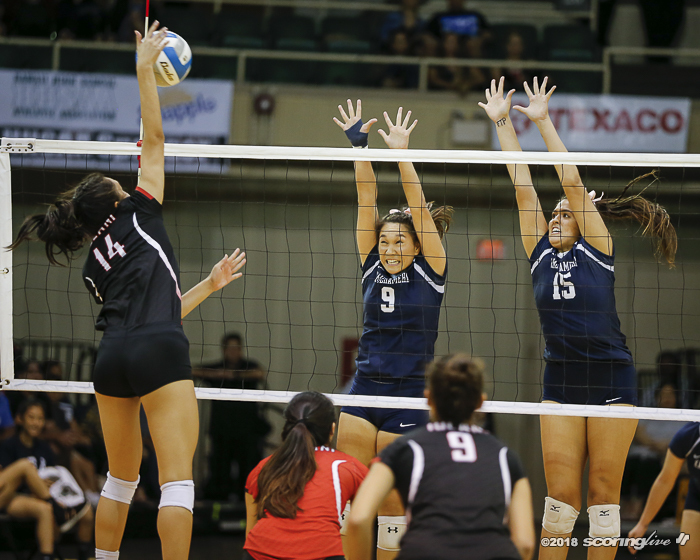 The Raiders eventually won the set on a four-contact violation by the Warriors. 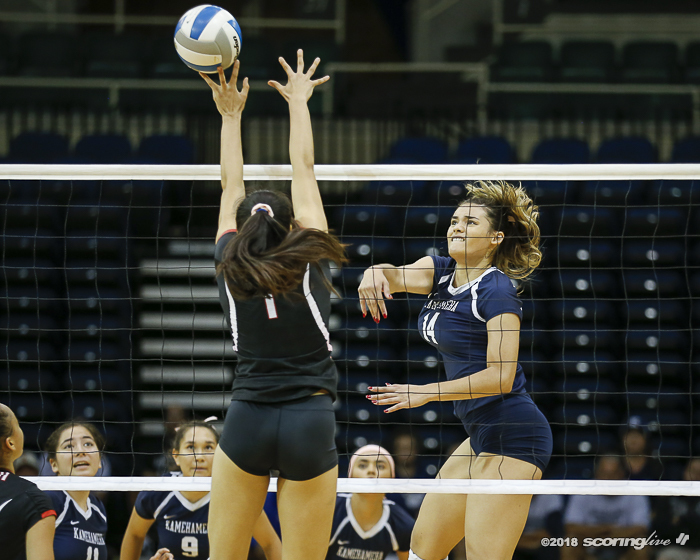 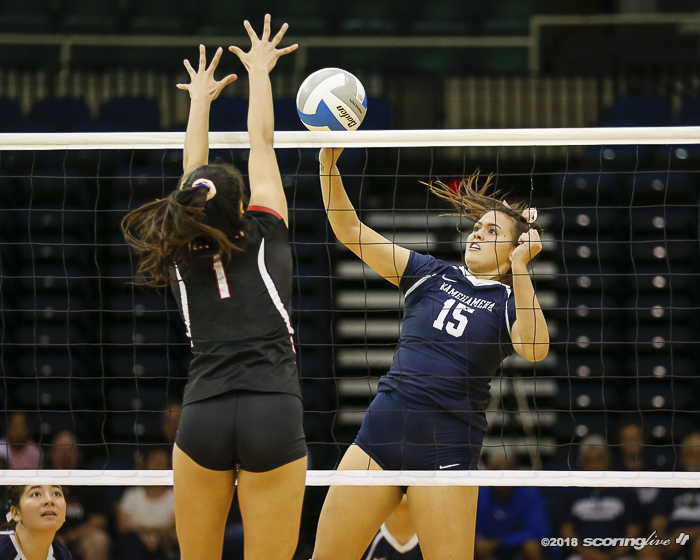 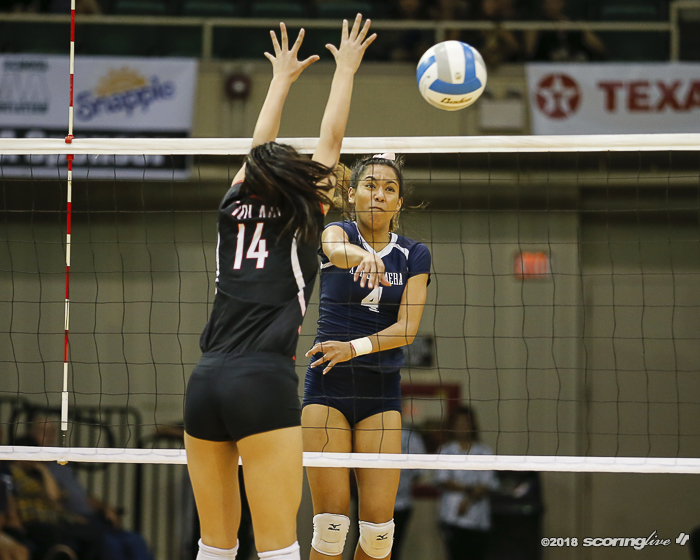 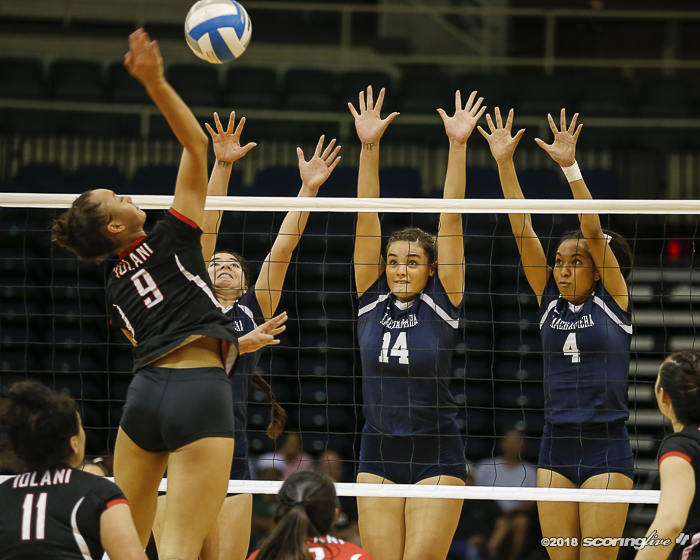 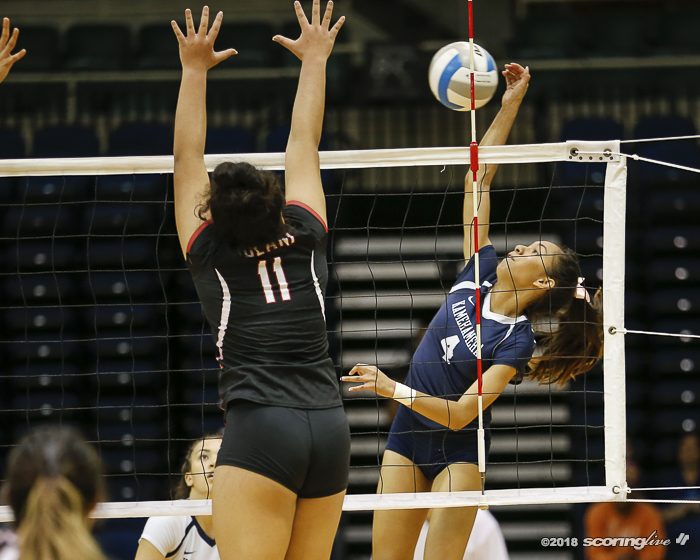 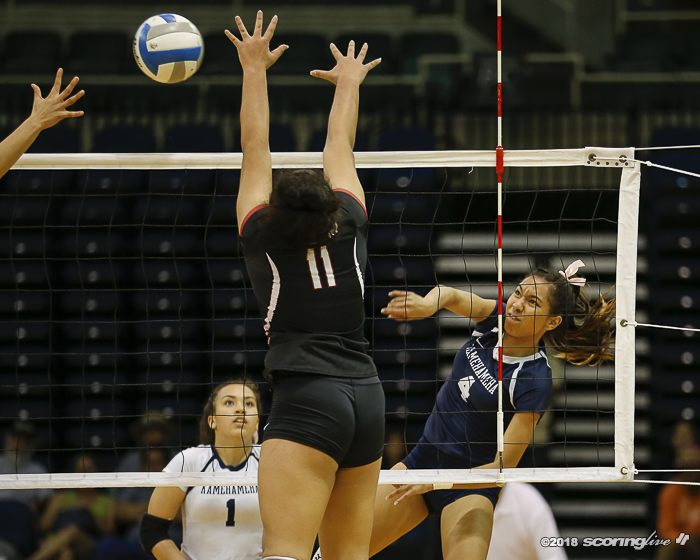 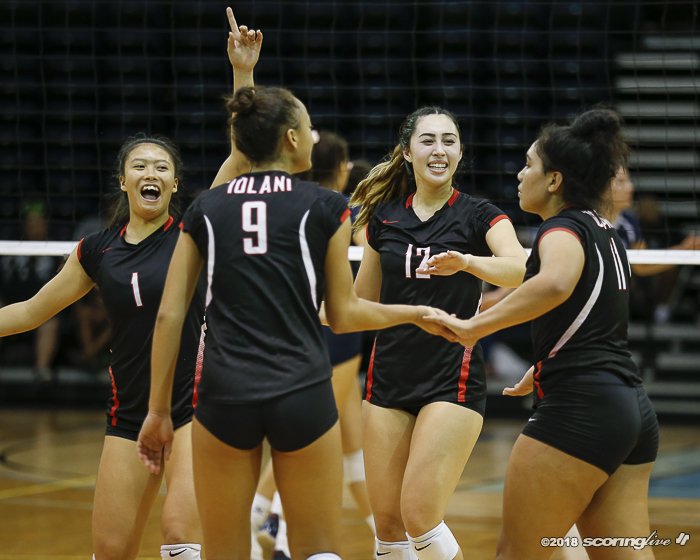 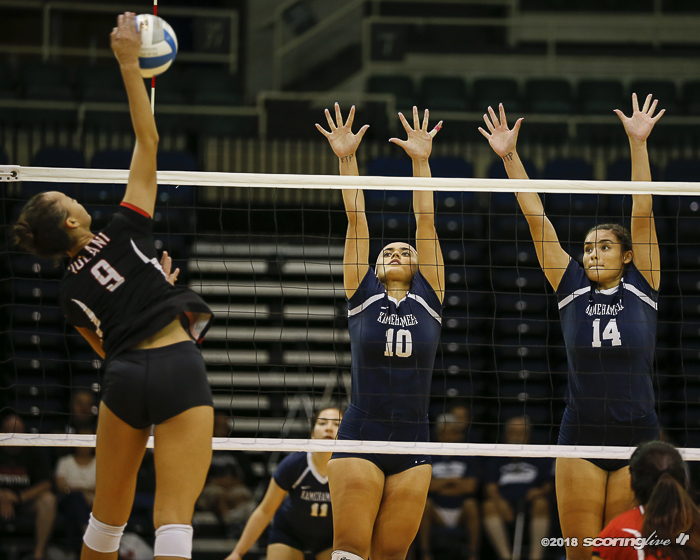 The teams were knotted at 7 in game 3 before a Kamehameha hitting error ignited an 8-0 Iolani run that included three kills and a solo block by Oglivie. 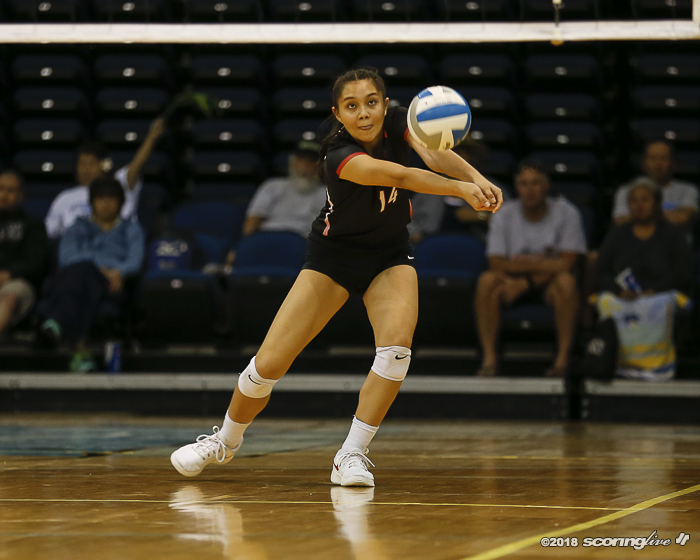 Oglivie put down 11 kills in game 3. 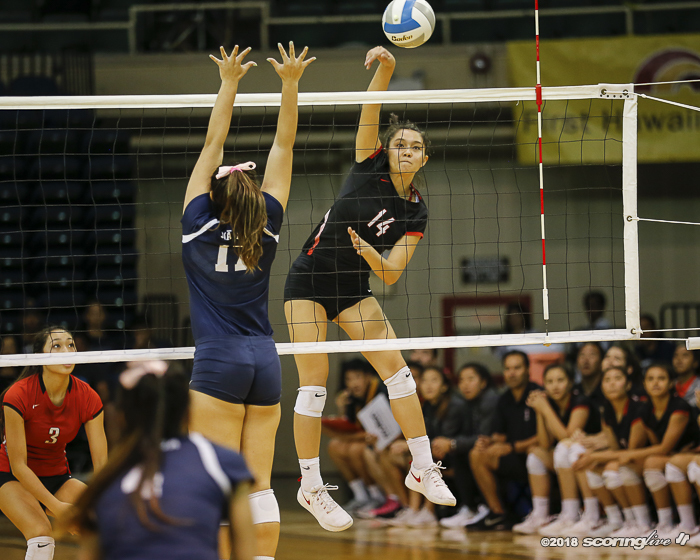 Late in the set, she put on display a full repertoire of attacks, including a kill out of the middle against a triple block. 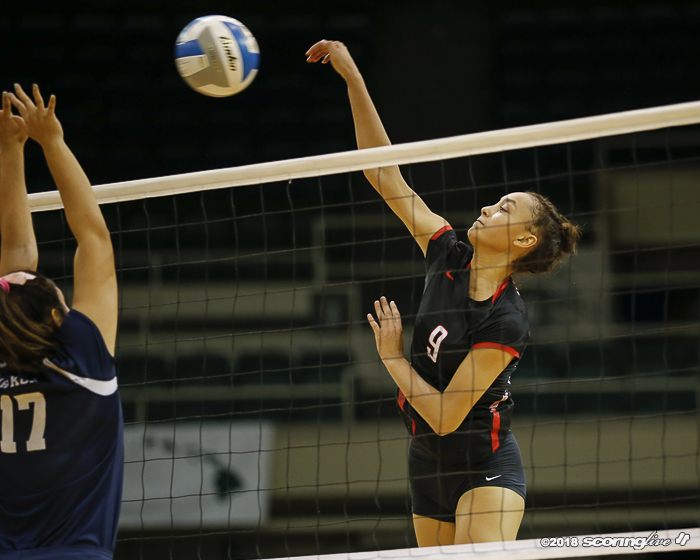 A few points later she put down back-to-back points on attacks off the block and out. 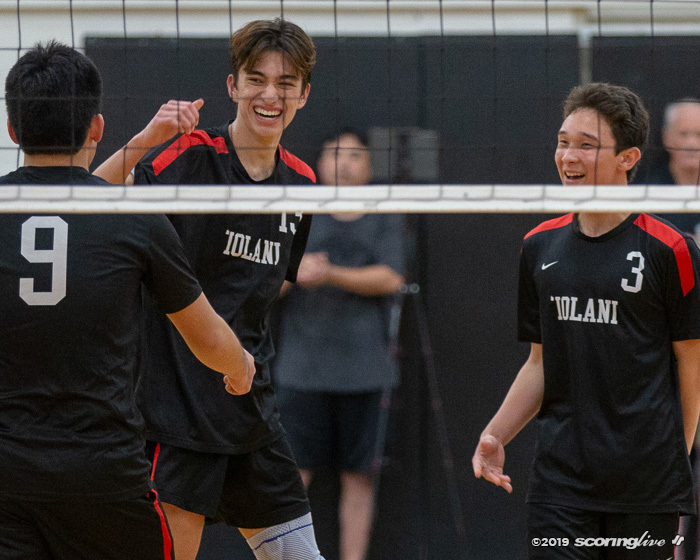 "I swung a lot in the first two sets and my coaches wanted me to keep swinging again and I tried to, but just seeing that their defense was moving back and just being smart and aggressively intelligent on your swings," said Oglivie, who was selected as the tournament's Most Outstanding Player. 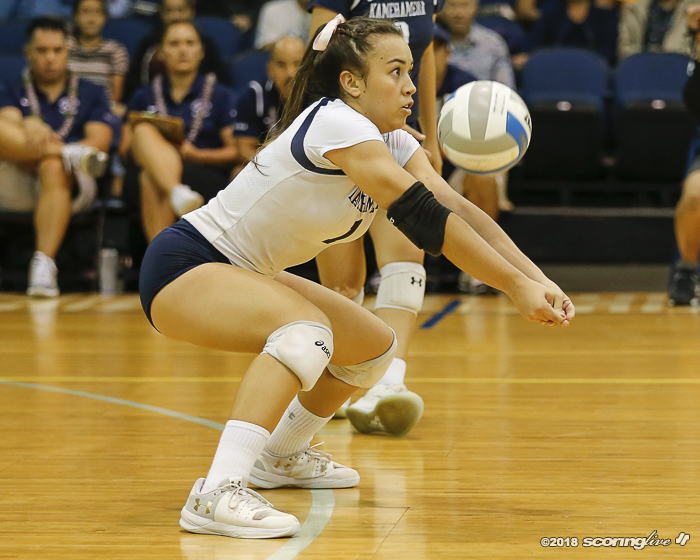 The Warriors cut the deficit to 24-18, but Oglivie ended the match with a roll shot from the left side off an assist from Kristen McDaniel, who had 35 assists to go with three kills, three digs and three block assists in the match. 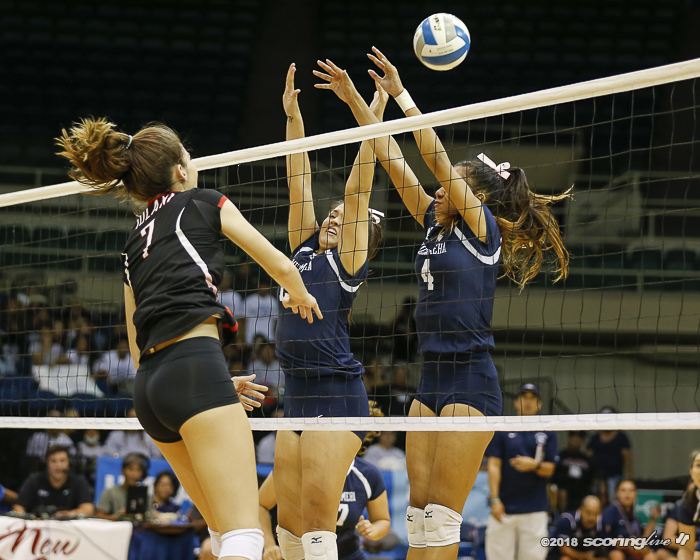 "I mean, we had to," Obrey said of Oglivie's 30 swings in set 3. 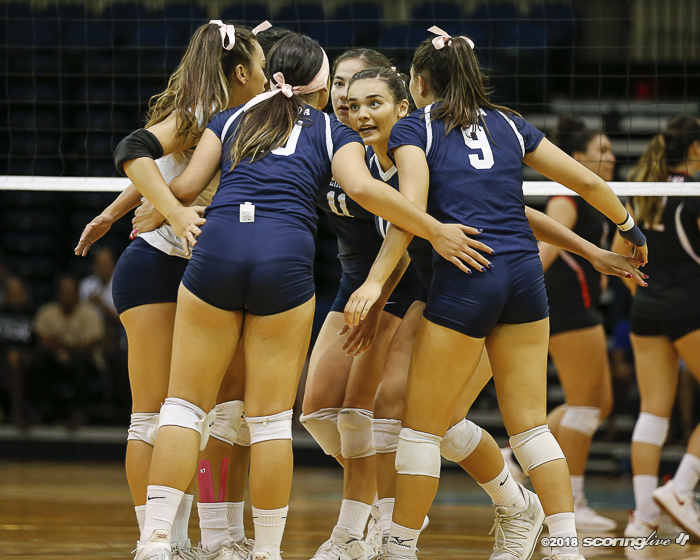 "We were trying to close it out, we can't give any breathing room to Kamehameha — they're good, they can close the gap quick — and we just wanted to feed our top hitter as often as possible and try to get out of here with a win and we're fortunate we did." 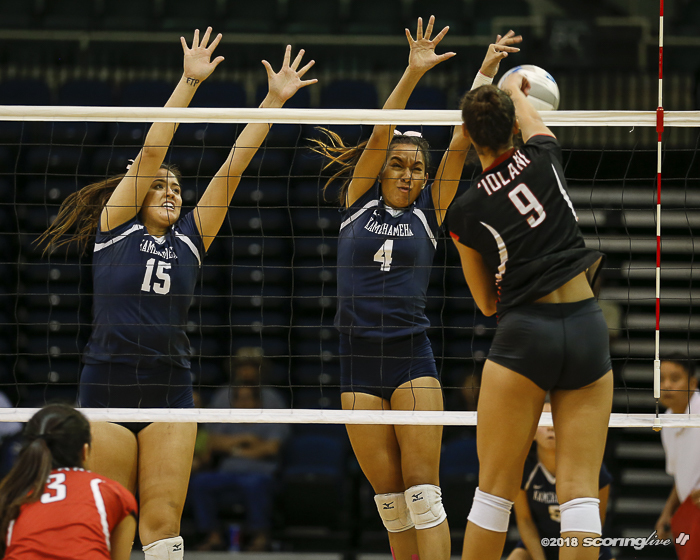 Keonilei Akana had 11 kills and 15 digs and Braelyn Akana added a team-high 15 kills in the loss. 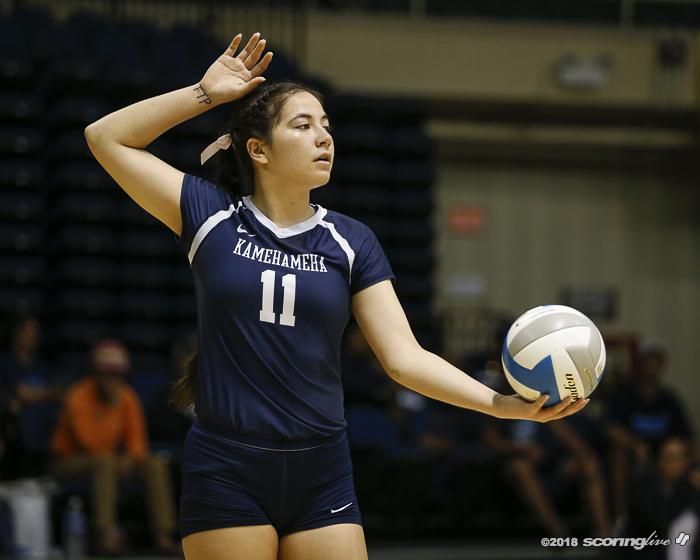 Paris Oliveira added 14 digs and Lexis Akeo notched 25 assists and nine kills for the Warriors. 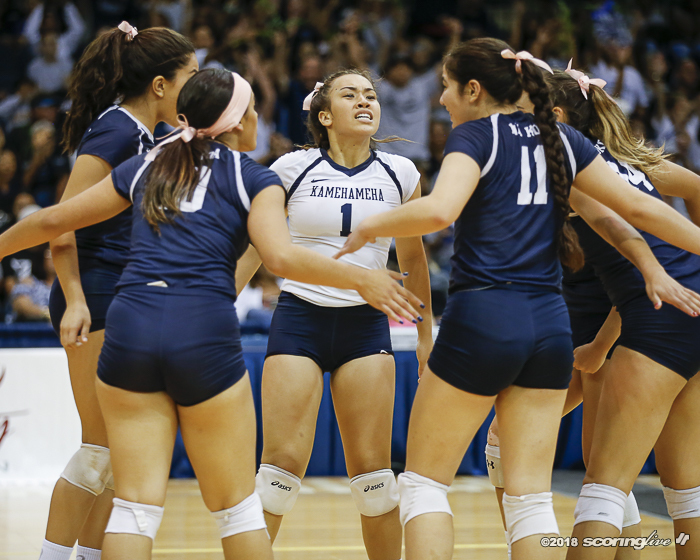 Kamehameha seeking its third state championship in four seasons and a record 21st state crown overall. 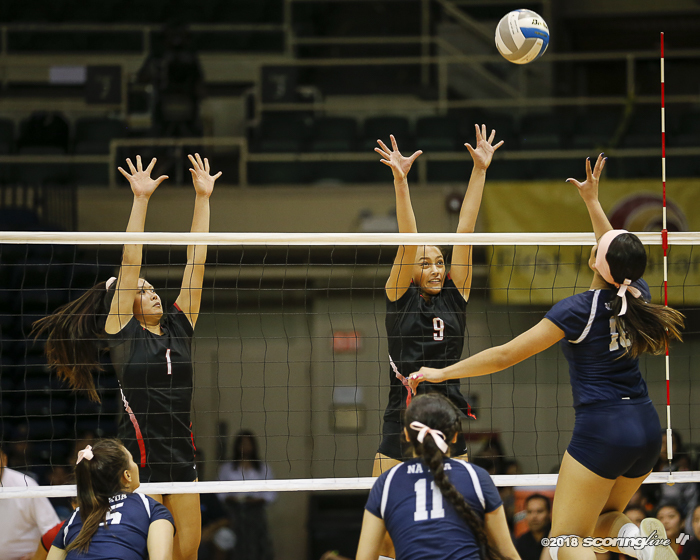 "Iolani played lights out. 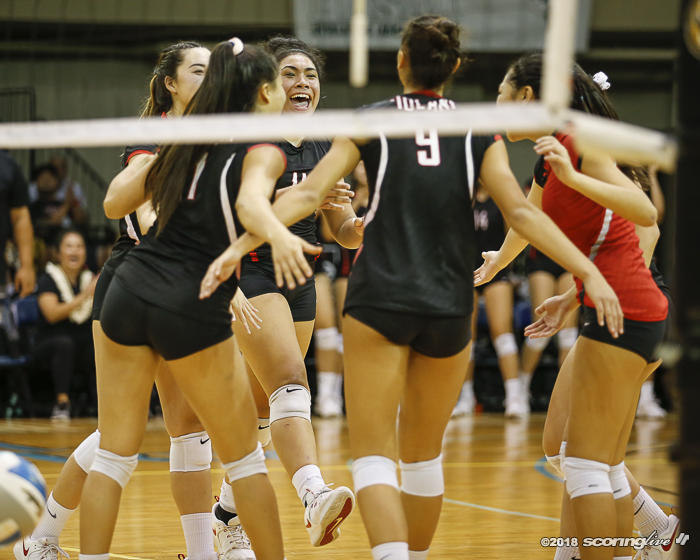 They definitely played their best match in the last match of the season," Warriors coach Chris Blake said. 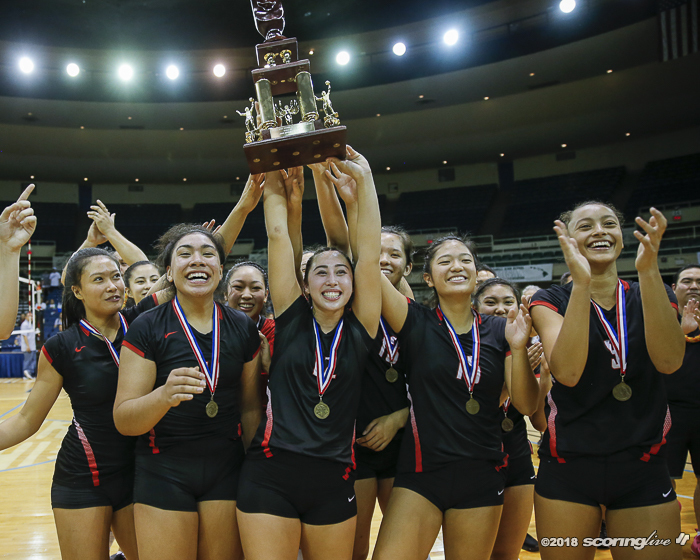 "We couldn't put a ball down. 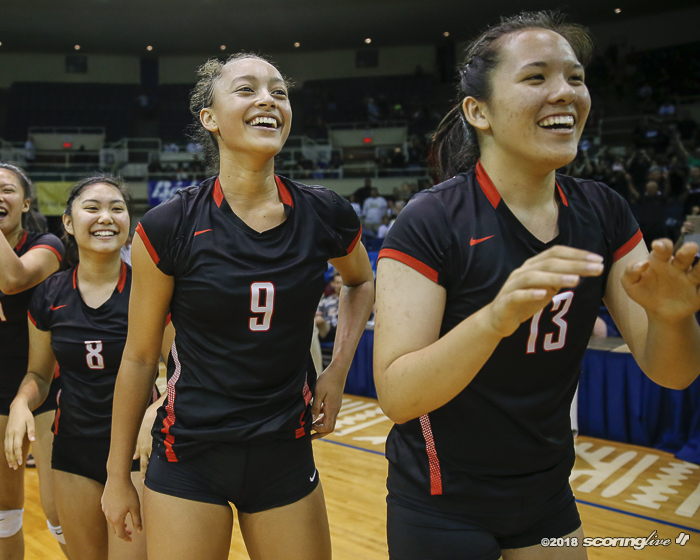 They were groveling after every play, they played lights out and hats off to them. 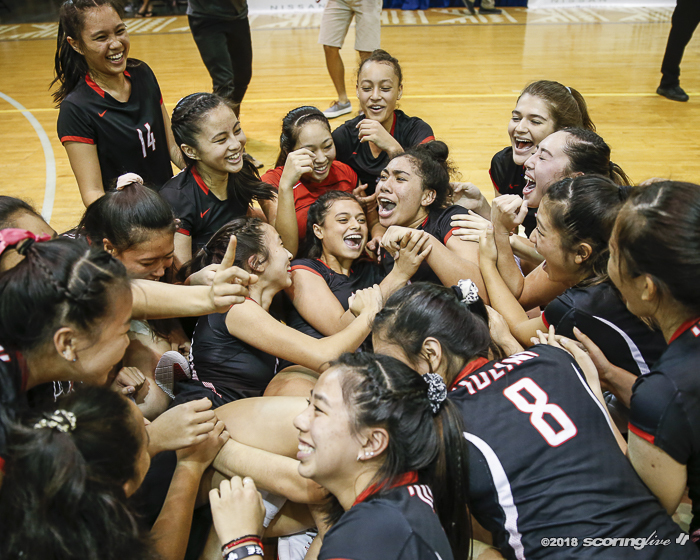 They came with their best match and we were just unable to come out. 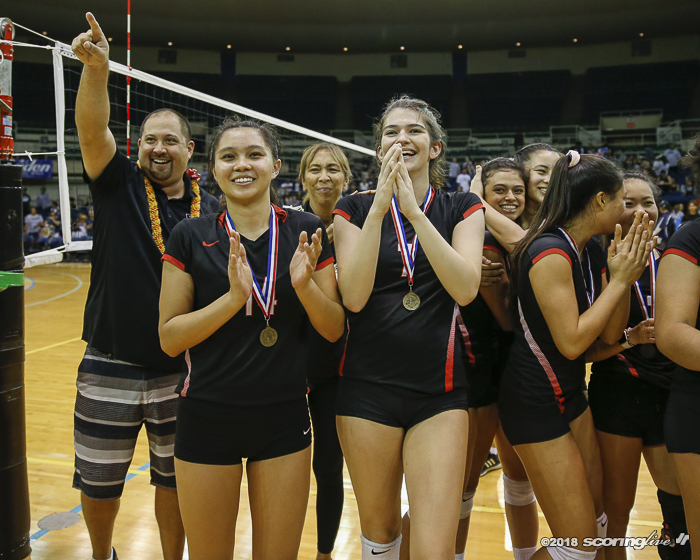 They put us into a lot of bad spots and we weren't able to answer." 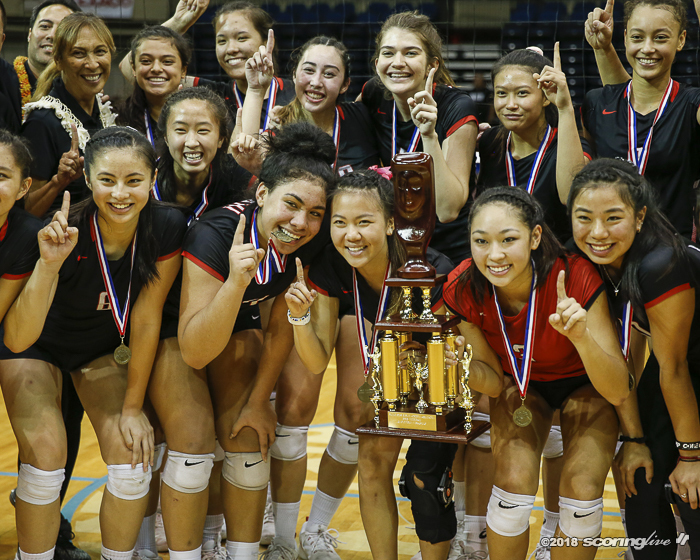 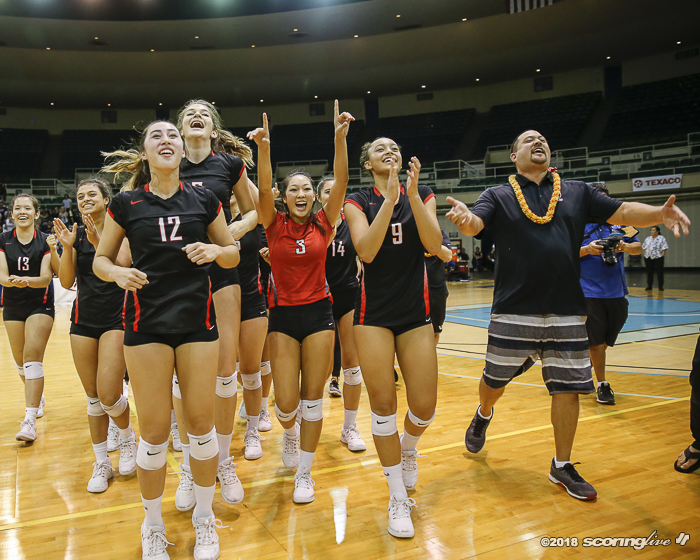 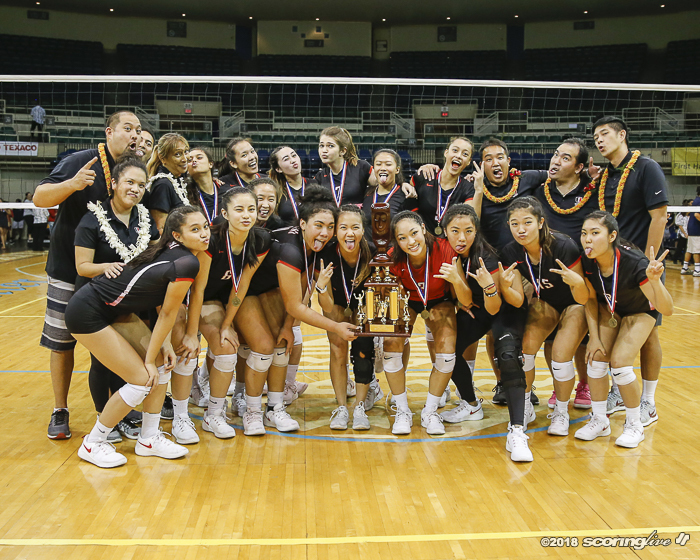 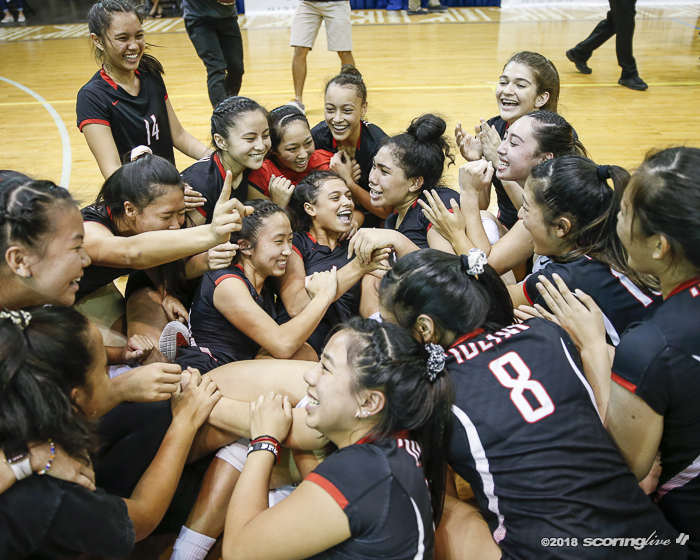 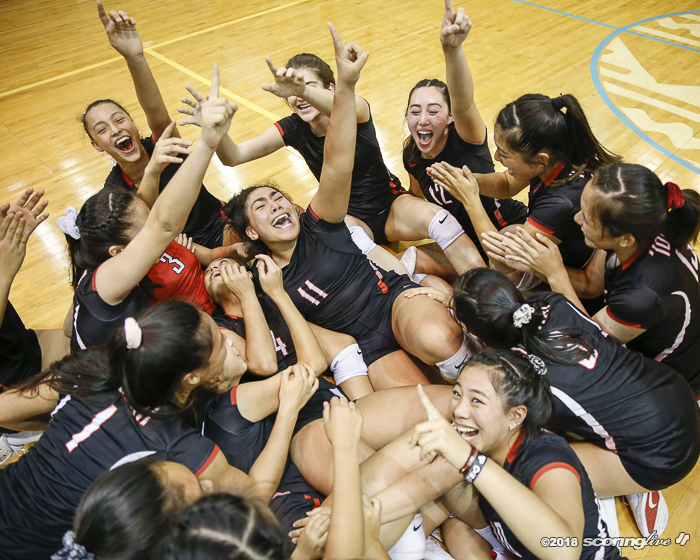 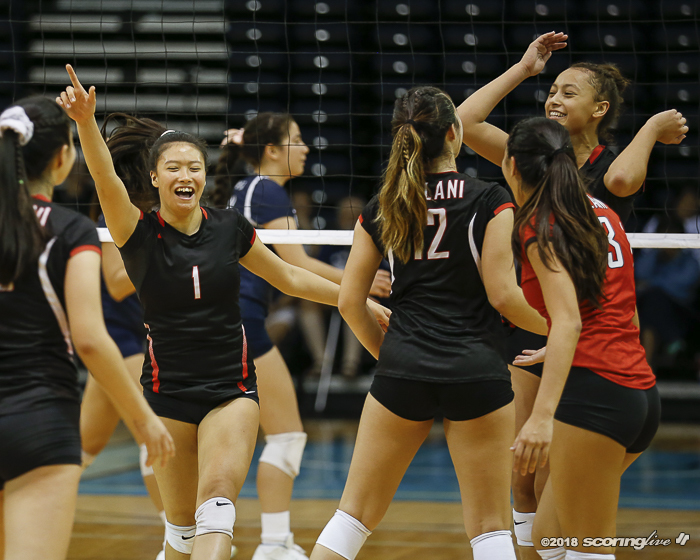 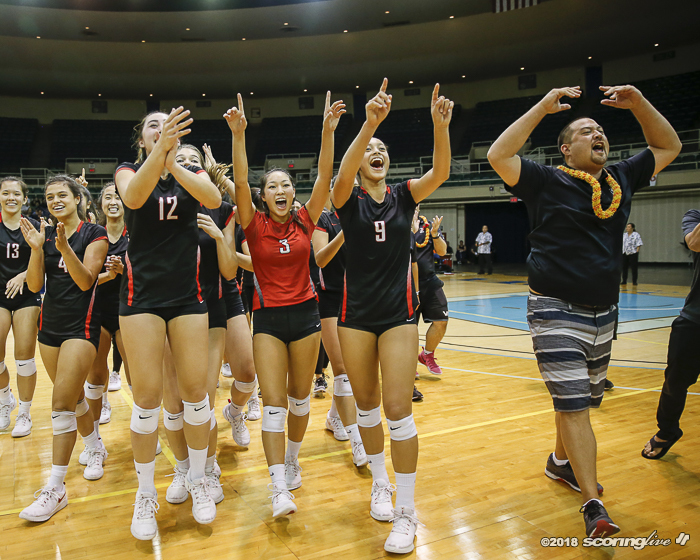 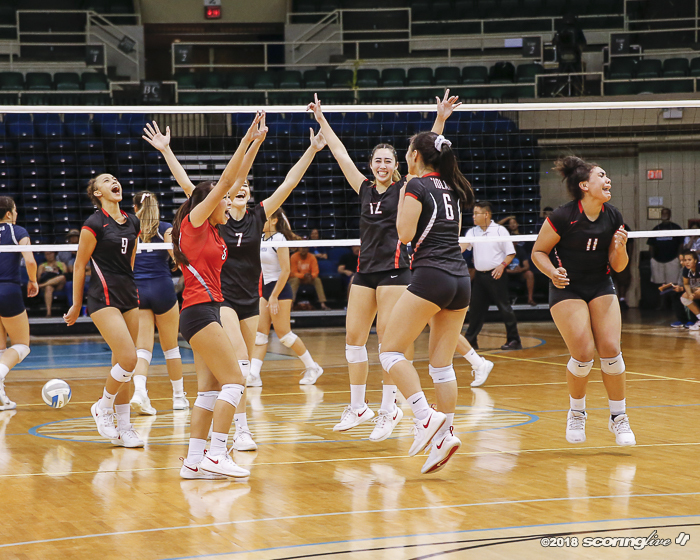 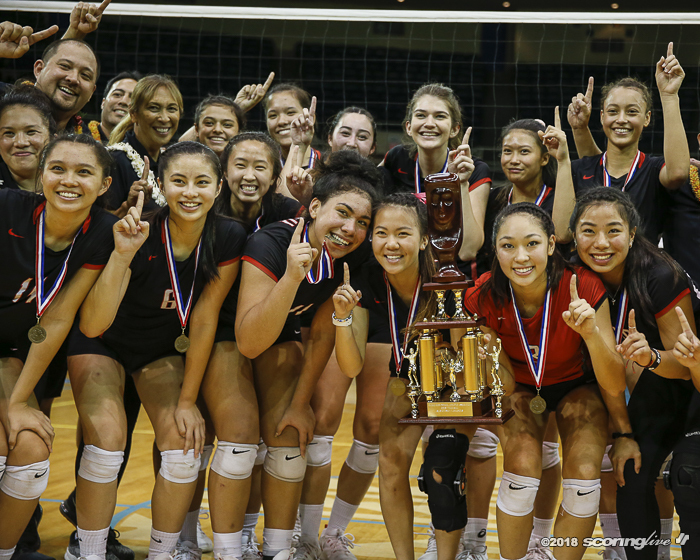 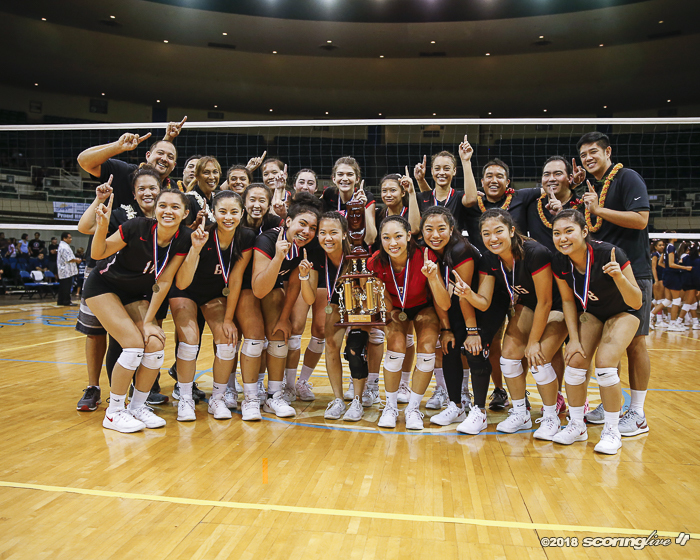 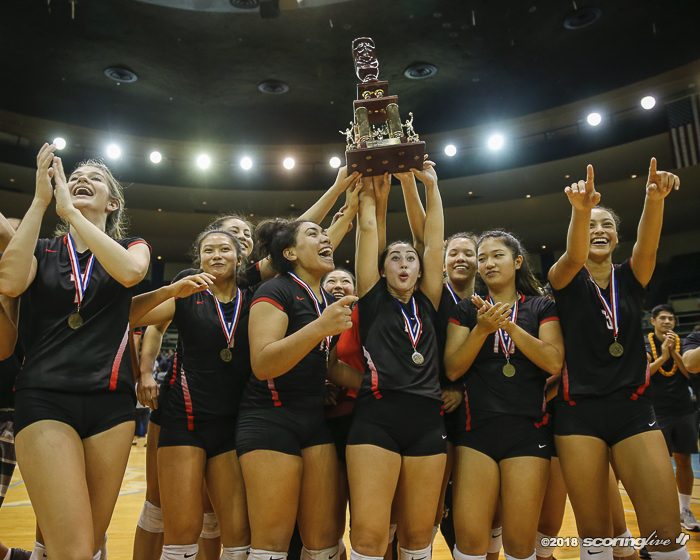 It was the 16th consecutive state final that featured two ILH teams and the fourth straight year that Iolani and Kamehameha met in the title match. 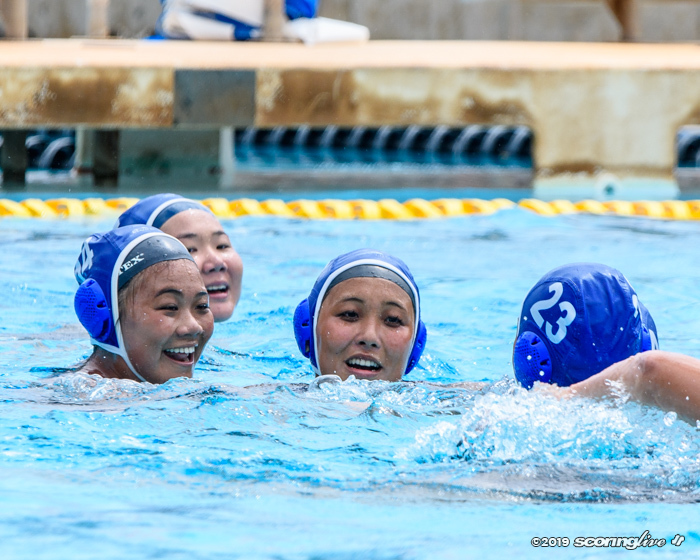 It was also the seventh meeting between the teams this season.